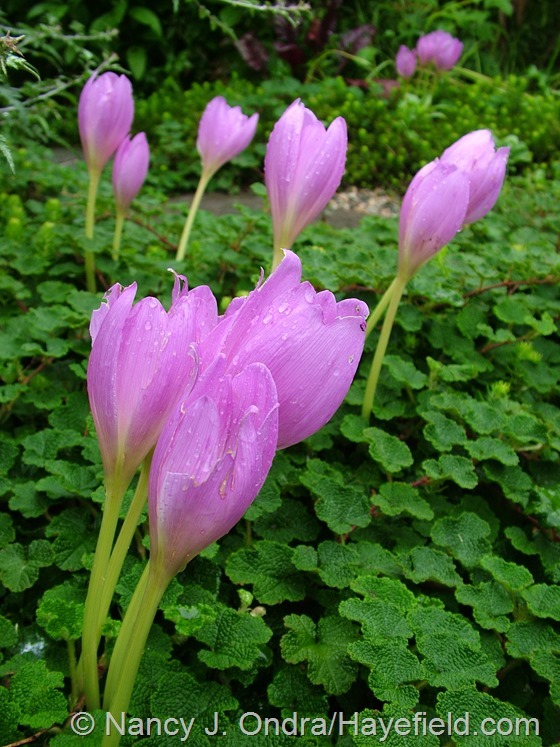 Mid- to late September is peak time for the colchicums here. Above is ‘Rosy Dawn’ coming up through creeping bramble (Rubus pentalobus); below is ‘Violet Queen’ paired with ‘Minerva’ canna and Chocolate Chip ajuga (Aguja reptans ‘Valfredda’). I don’t often have luck with the fall crocus species lasting more than a year or two, so it was a joy to spot the return appearance of this sweet little Crocus speciosus ‘Oxonian’ popping up through the ‘Angelina’ sedum (Sedum rupestre) along the path to the barn. 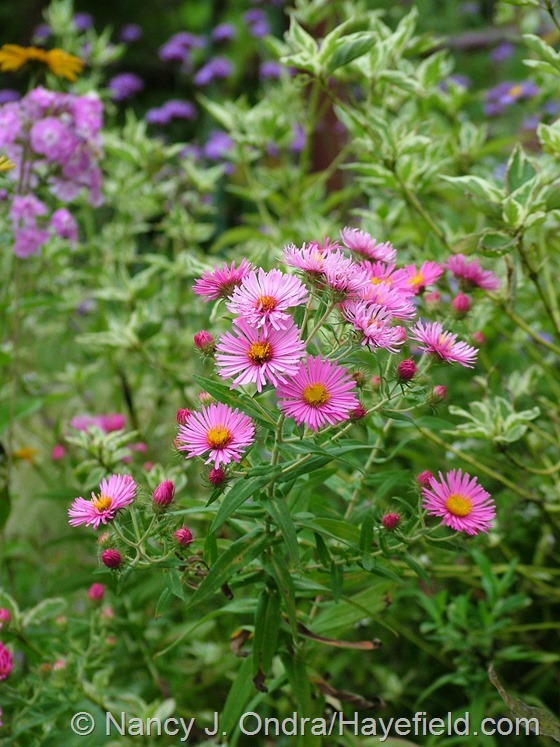 Of course, October is aster season, and I’ve been enjoying many of them here. 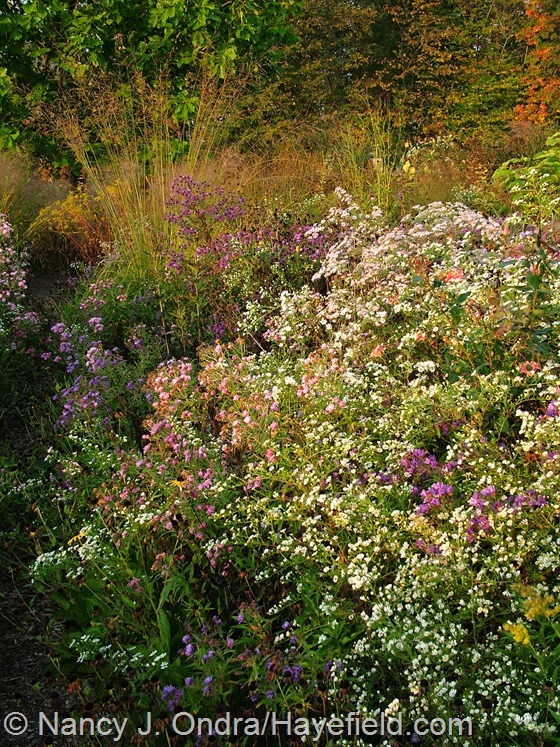 Above is ‘Harrington’s Pink’ New England aster (Symphyotrichum novae-angliae); below is ‘Hella Lacy’ New England aster with ‘Moldova’ marigold (Tagetes patula). 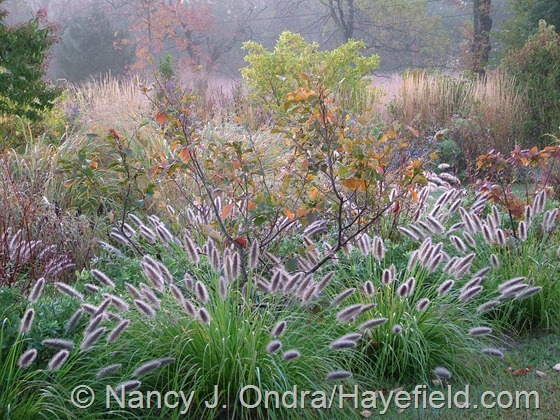 And below are some of their seedlings out in the meadow, with some broomsedge (Andropogon virginicus) in back. Just as some of the garden asters have seeded out into the meadow, some of the native meadow asters have blown into the garden. 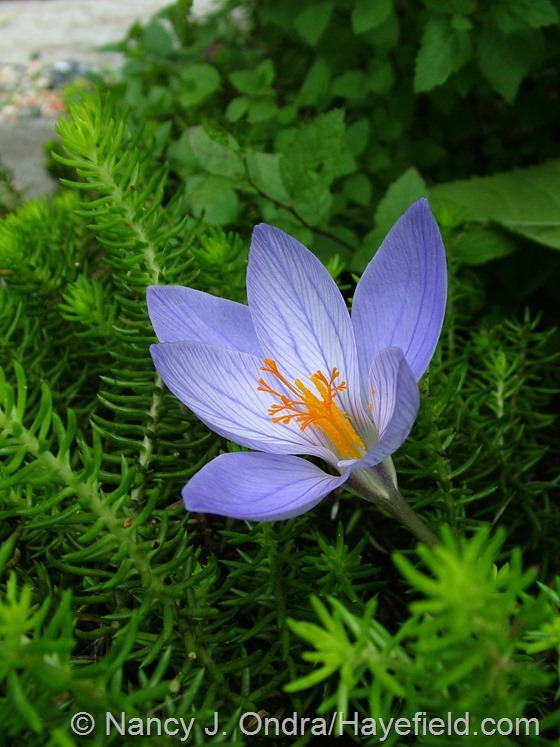 I pull out a lot of them as seedlings but inevitably (and luckily) always overlook a few until they flower. 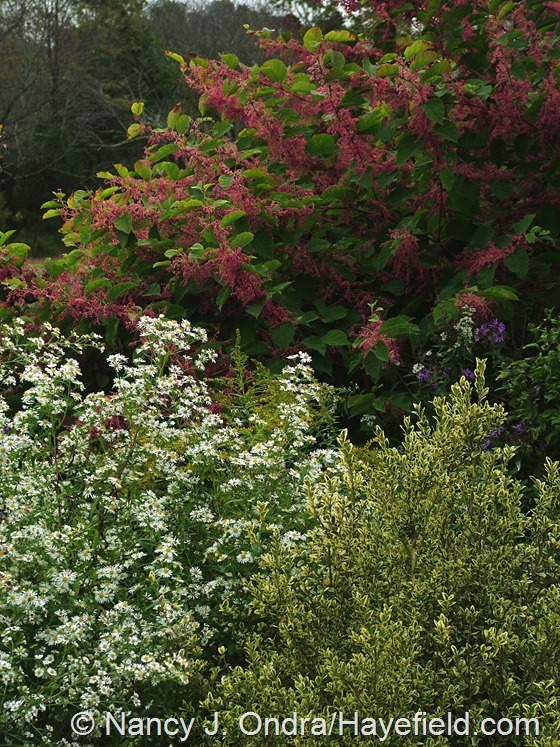 Many of the asters with little white flowers are hard to tell apart, especially from a picture, but I know that this one is a heath aster (Symphyotrichum ericoides), with Persicaria ‘Crimson Beauty’ and variegated boxwood (Buxus sempervirens ‘Elegantissima’). 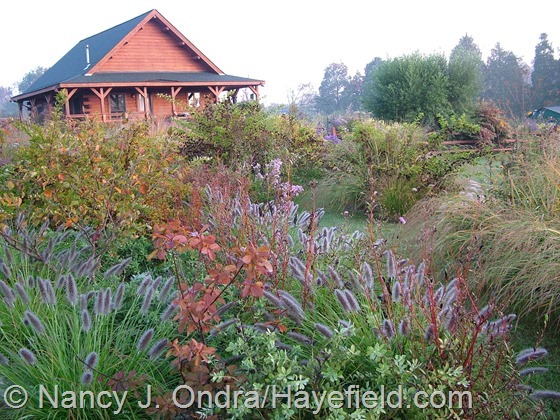 Above is aromatic aster (Symphyotrichum oblongifolium) with ‘Heavy Metal’ switch grass (Panicum virgatum). 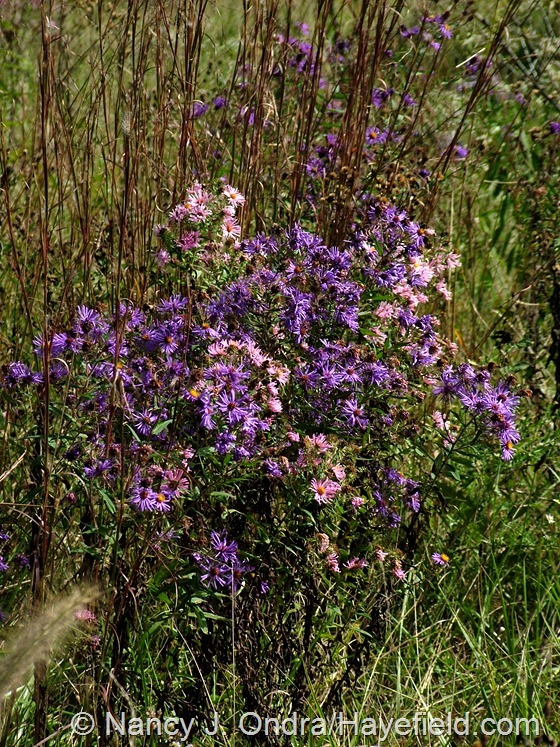 And one more: still-an-Aster Tatarian aster (Aster tataricus). Fall is prime time for chrysanthemums, too. 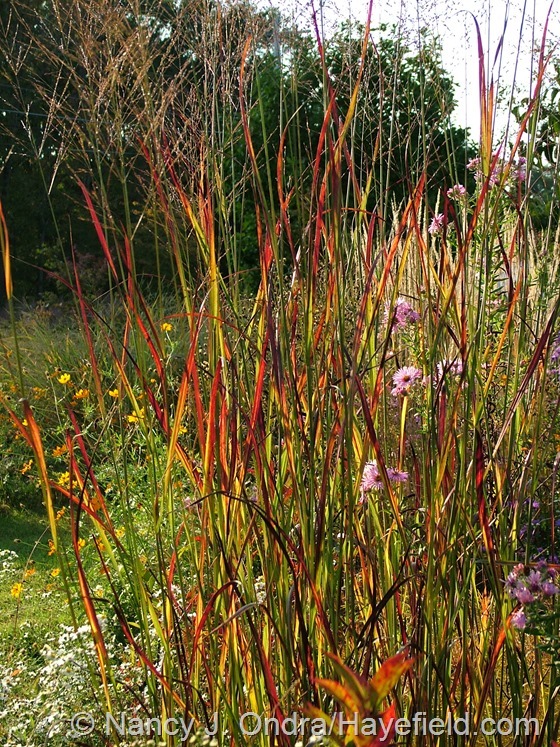 I have just two here at the moment: above is ‘Sheffield Pink’ and below is yellow ‘Harmony’, with fall-colored American ipecac (Porteranthus stipulatus), the seedheads of ‘Cassian’ fountain grass (Pennisetum alopecuroides), and exotic love (Mina lobata). 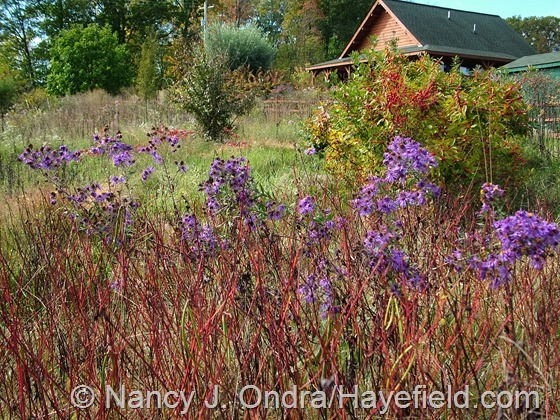 Most of the ironweeds (Vernonia) are setting seed now, but ‘Iron Butterfly’ narrow-leaved ironweed (V. lettermannii, above) didn’t even start blooming until late September. It’ll be in flower for another week or two yet. 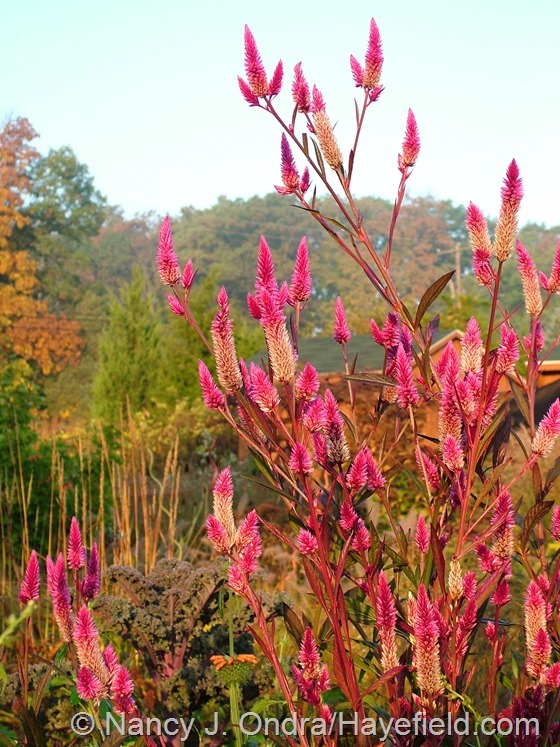 ‘Crimson Beauty’ knotweed (Persicaria) opens creamy white in mid-September, turning rosy pink by early October and holding that color through the month. It’s a big thing but nicely in proportion to the pollarded silver willow (Salix alba var. 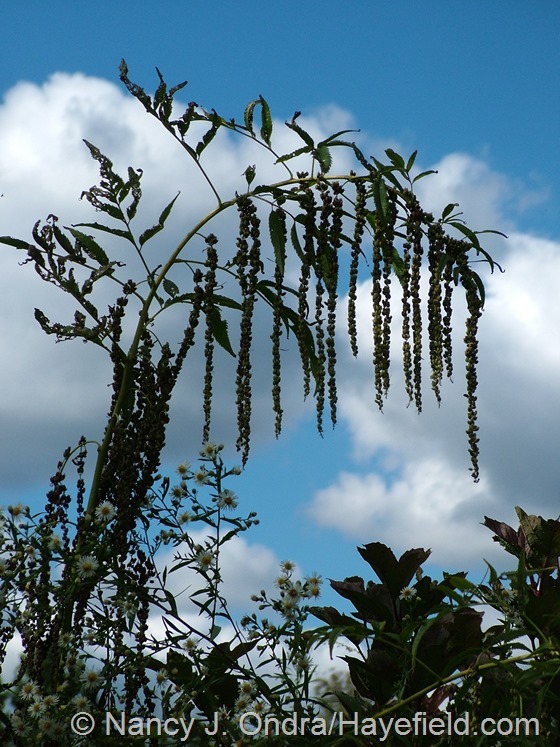 sericea). 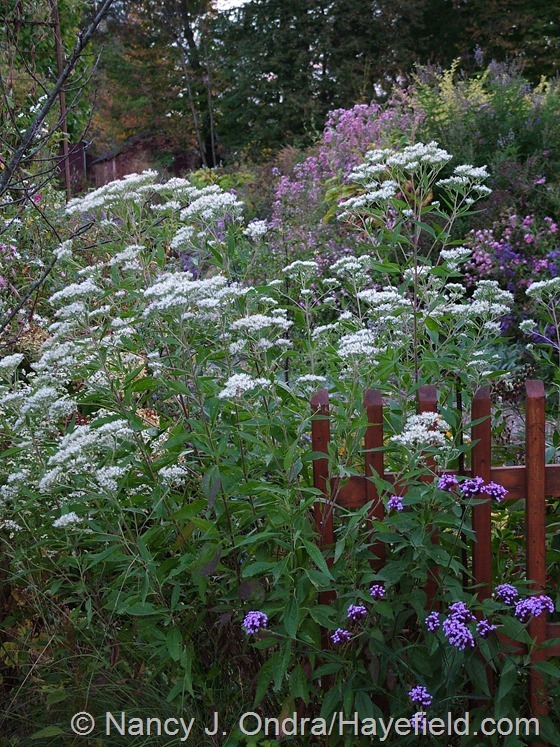 Mid-September to mid-October is also peak time for white snakeroot (Ageratina aromatica, above). 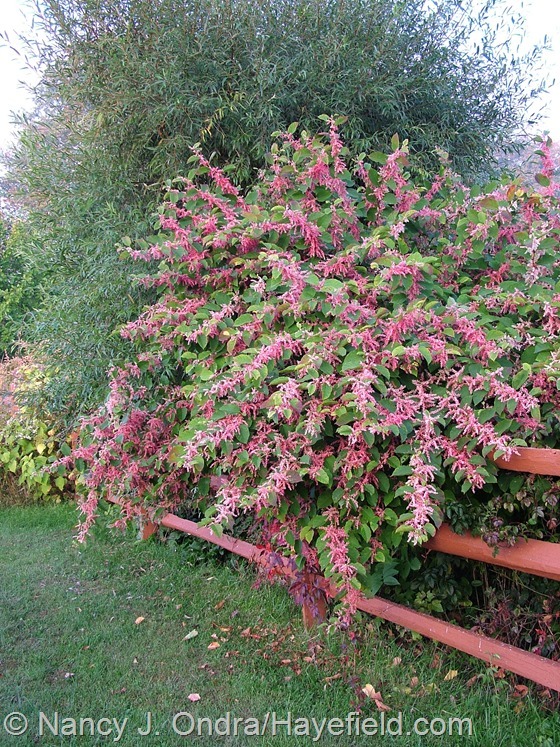 Seven-sons tree (Heptacodium miconioides) has technically been done flowering for several weeks, but the rosy pink calyces linger to keep the interest going well into fall. 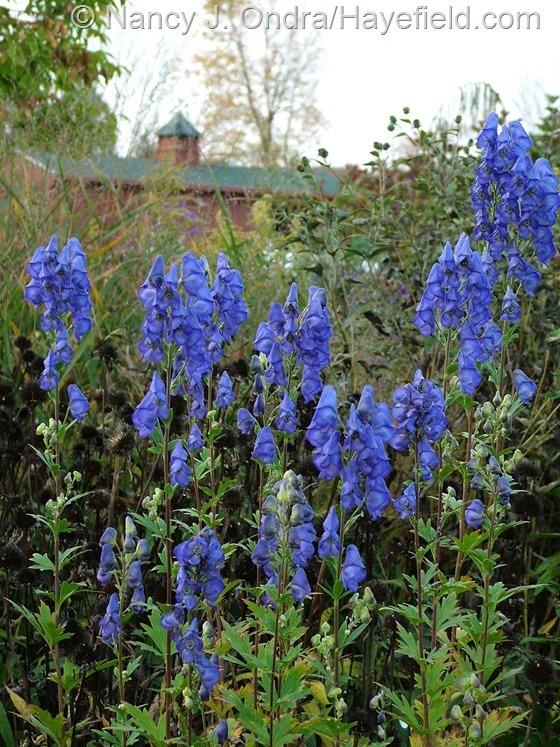 Azure monkshood (Aconitum carmichaelii, above) colored up around the beginning of October and looks gorgeous now. Golden lace (Patrinia scabiosifolia) is mostly into the seed stage by this time, but the plants that I cut back in late summer still have some fresh flowers. 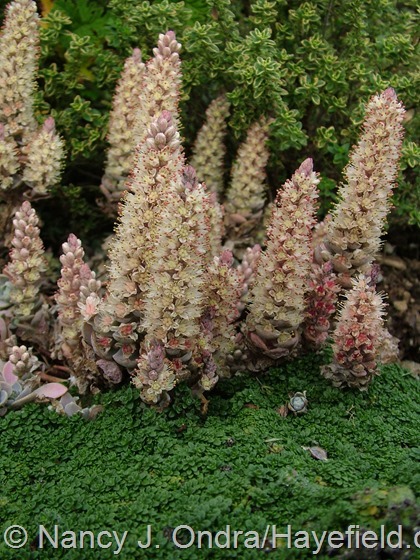 Lots of late bloomers are plenty tall, but dunce’s cap (Orostachys iwarenge) is less than 6 inches in flower. 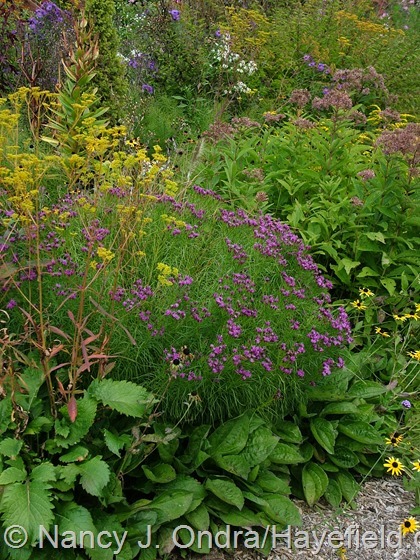 Below it’s between ‘Elfin’ thyme (Thymus serpyllum) and variegated lemon thyme (T. x citriodorus ‘Aureus’). Lots of annual vines are looking prime by now. 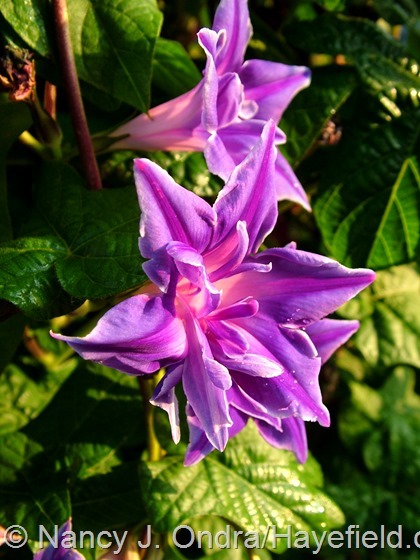 Above and below is a lovely picotee Japanese morning glory (Ipomoea nil) from my friend Clark; some of the blooms are single and some have extra petals. 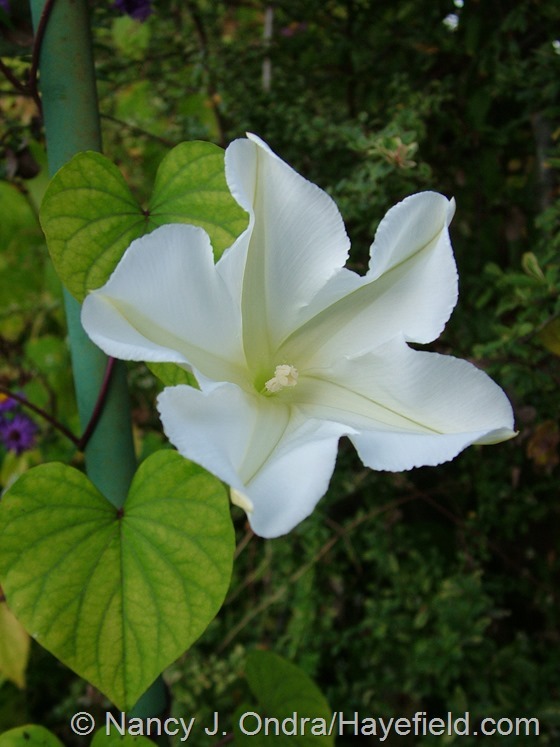 The first flower on moonflower (Ipomoea alba) finally opened a week ago, while the exotic love (Mina lobata)—also known as Spanish flag—has been spectacular for several weeks. I’ve been waiting almost a decade to see a flower on cathedral bells (Cobaea scandens) here. 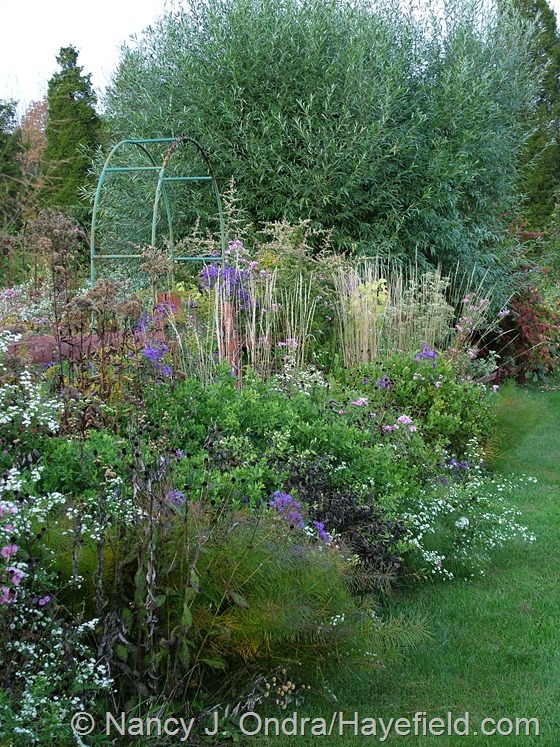 I had great luck with it in my previous garden, and I keep planting it here even though it rarely even forms buds before frost. For whatever reason, it finally decided to cooperate this year – yay! 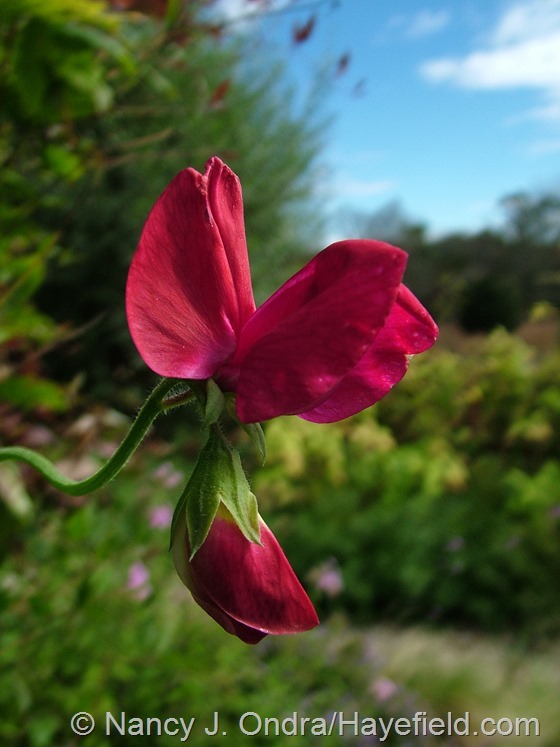 For the next 10 years, I’ll probably be hoping to have sweet peas (Lathyrus odoratus) in flower from July all the way into October, as I have this season, and I’ll probably be disappointed. But it will be fun trying. 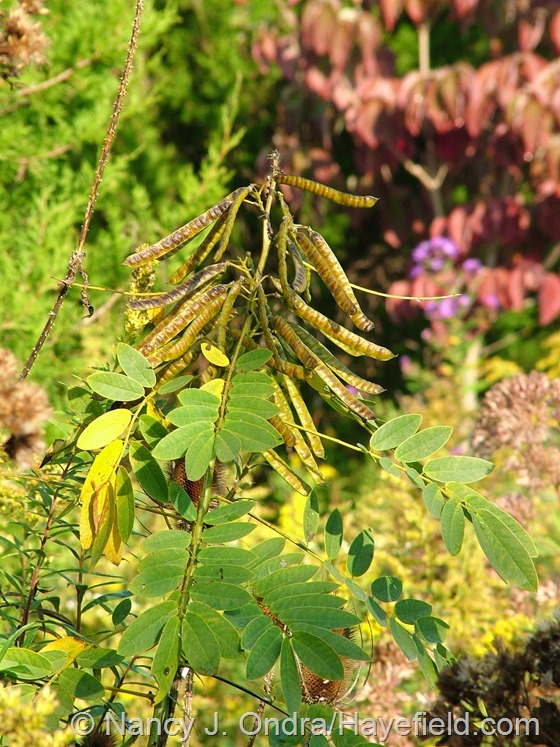 Hey, Rick – as you may know by now, your “Cassia sp.” seeds turned out to be winter cassia (Senna [Cassia] bicapsularis). It’s been a really pretty foliage accent (particularly interesting when the leaves all fold together at night), and it finally started flowering this month. If it doesn’t set seed before frost, I may try to overwinter it in the basement, since it’s not hardy here in mid-Zone 6. 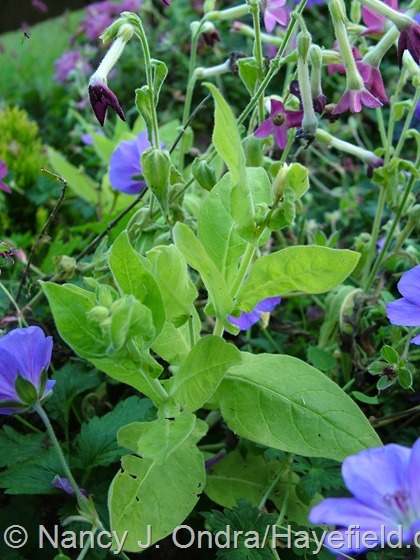 Another new-for-me thing this year is a little yellow-leaved flowering tobacco (Nicotiana) from reader Kim M. Last winter, he sent me a packet of seed he had collected back in 2002. Those 10-year-old seeds still germinated just fine, and I ended up with a half-dozen seedlings that all have chartreusey leaves. 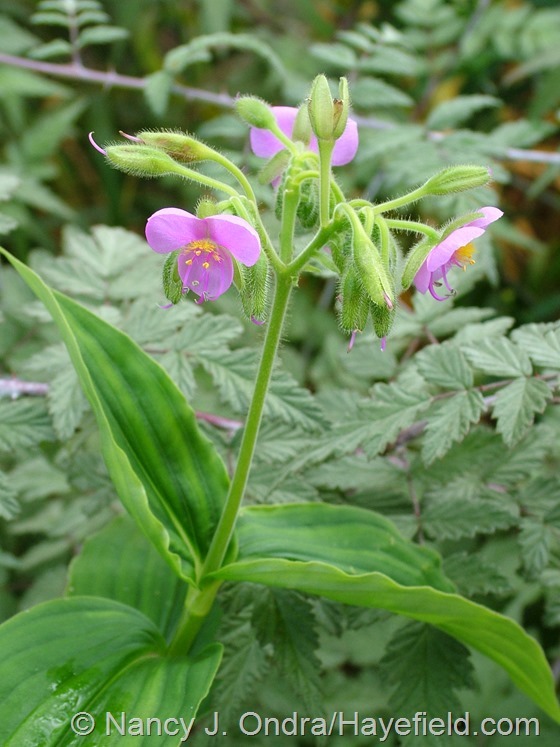 The plants grew 8 to 10 inches tall, with pink flowers. 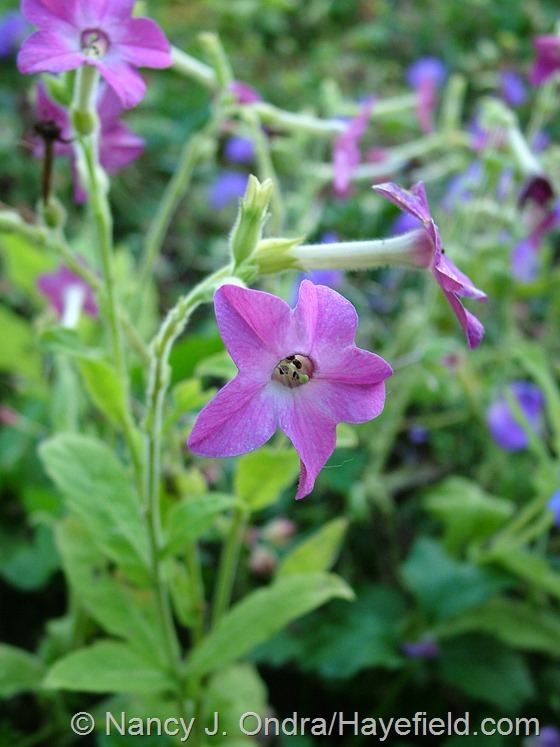 I have to admit that this is not the most beautiful nicotiana I’ve grown—it has the unfortunate habit of holding on to its dead flowers—but I’m very pleased to have it for the foliage color and hope that it may eventually cross with some of my others. I’ll have seeds of this one (which I’m calling ‘Kim’s Gold’) available to share with any of you who like to experiment with chartreuse foliage. 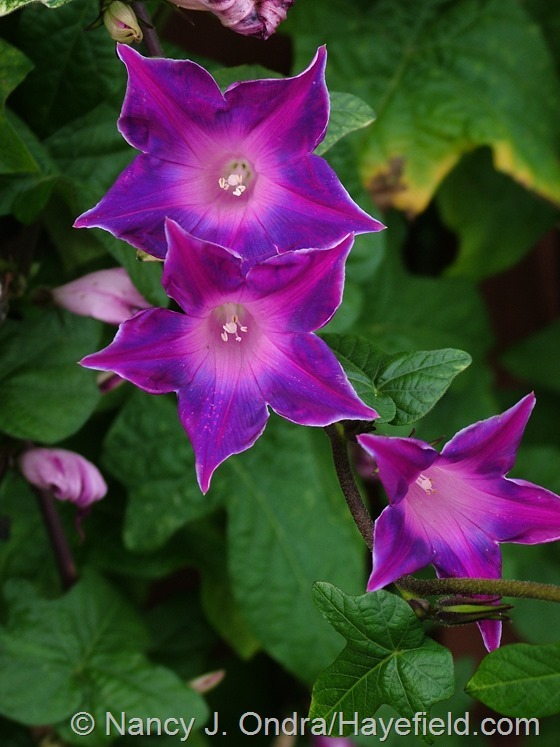 Speaking of nicotianas crossing: I’ve been growing ‘Mutabilis’ in one spot for several years, and this year’s volunteer plants looked similar, but their flowers were not what I expected: instead of opening white and turning pink, they start pale pink and age to purple. It will be interesting to see how they turn out next year. 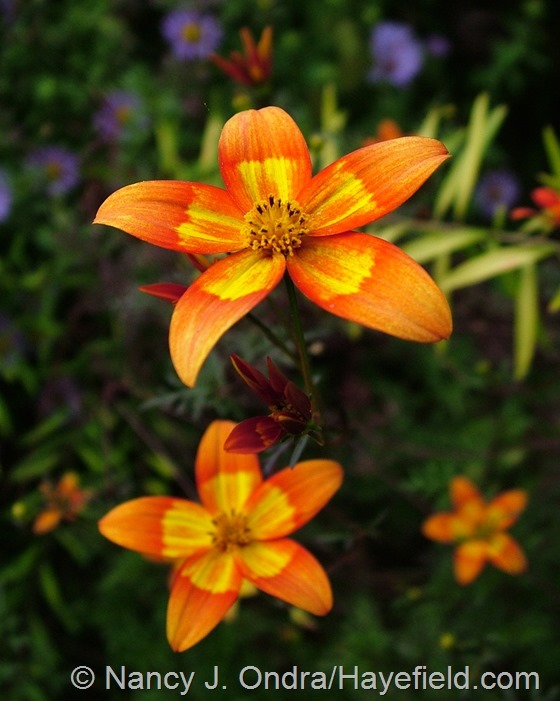 Bidens ‘Hawaiian Flare Orange Drop’ is another new thing for me this season. The plant has been kind of straggly-looking through the summer (probably because it was shaded by some taller plants), but it’s been filling out now that its getting more light, and the flowers are a great color. I’m definitely trying it again next year. Sulphur cosmos (Cosmos sulphureus) has also been spectacular over the last 6 weeks—once the deer stopped eating it. 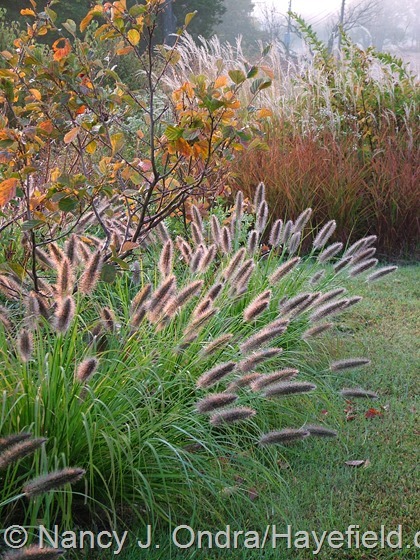 Below it’s with flame grass (Miscanthus ‘Purpurascens’). 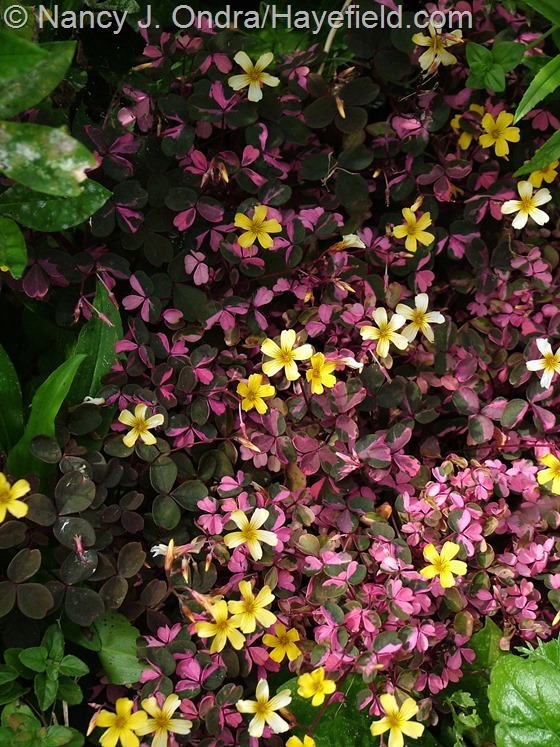 I couldn’t resist picking up this Oxalis ‘Plum Crazy’ when I saw it in leaf back in the spring. I think I’d like it better without the yellow flowers, though. Two not-new annuals that are looking really nice now: above, ‘Cramers’ Amazon’ celosia, and below, widow’s tears (Tinantia erecta). 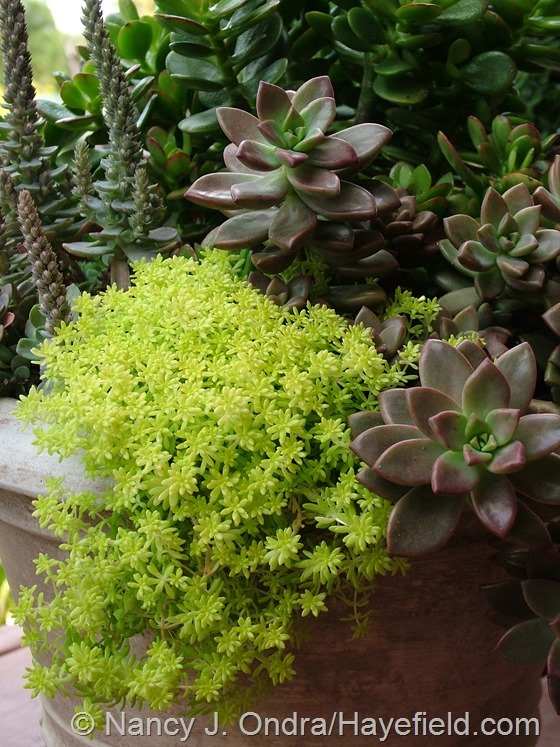 …and ‘Tokyo Sun’ sedum (Sedum japonicum), below with x Graptosedum ‘Bronze’. 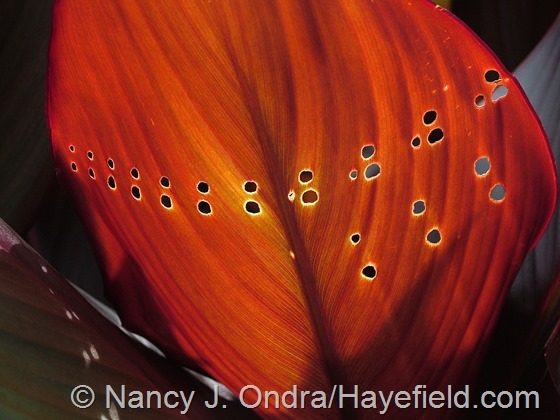 Below is a leaf of ‘Australia’ canna that must have gotten chewed by something before it unfurled. It’s hard to think of something that interesting-looking as “damage,” though. 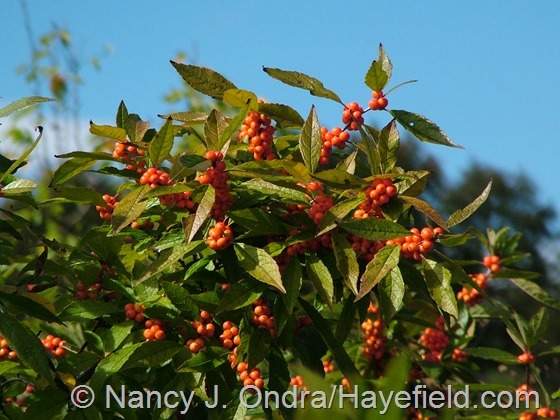 …and the winterberries (Ilex verticillata): ‘Winter Gold’ above and ‘Winter Red’ below. 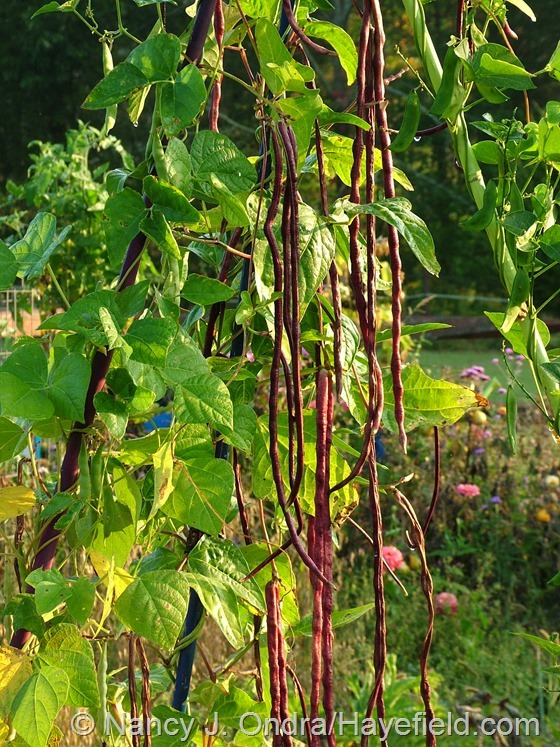 The beans are looking great now too: above is ‘Red Noodle’ and below is ‘Pretzel Bean’ (both Vigna unguiculata). And Dee, I’m delighted with the pinto beans you shared with me; thanks so much! I have nearly a whole bushel basket full of pods waiting to be shelled for winter eating. 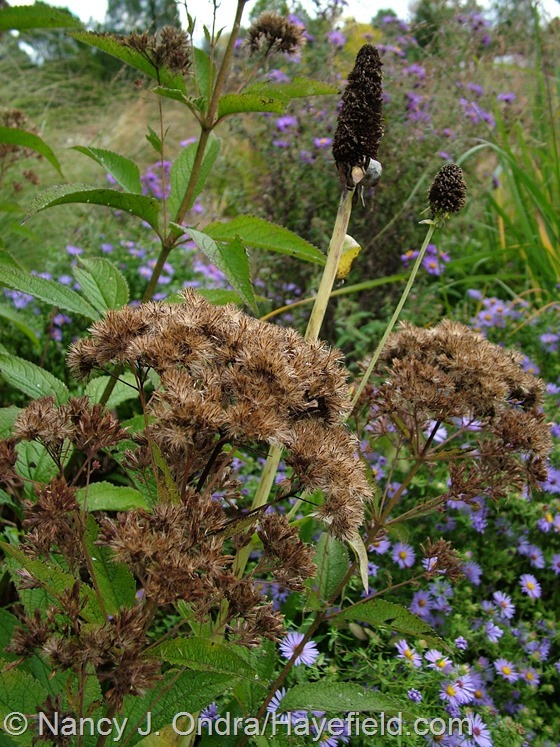 Among the usual seasonal seedheads are Joe-Pye weed (Eutrochium purpureum) and giant coneflower (Rudbeckia maxima) above and Culver’s root (Veronicastrum virginicum) below. 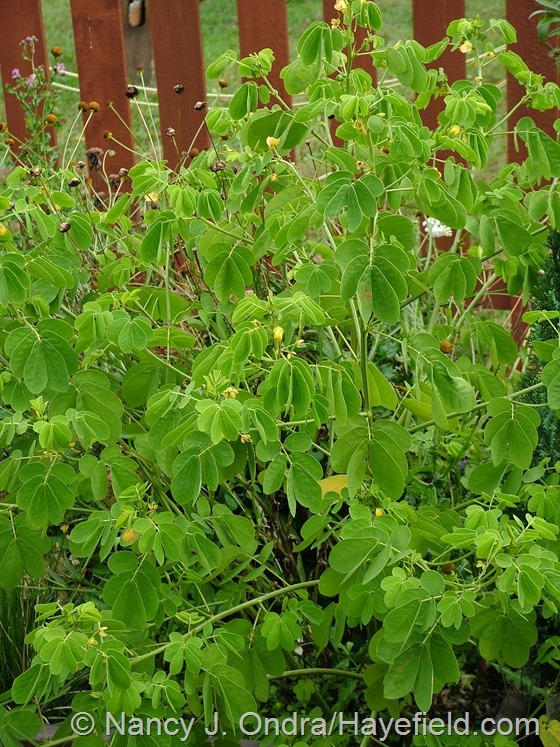 Above, Maryland senna (Cassia marilandica) in the meadow; below; false hemp (Datisca cannabina). 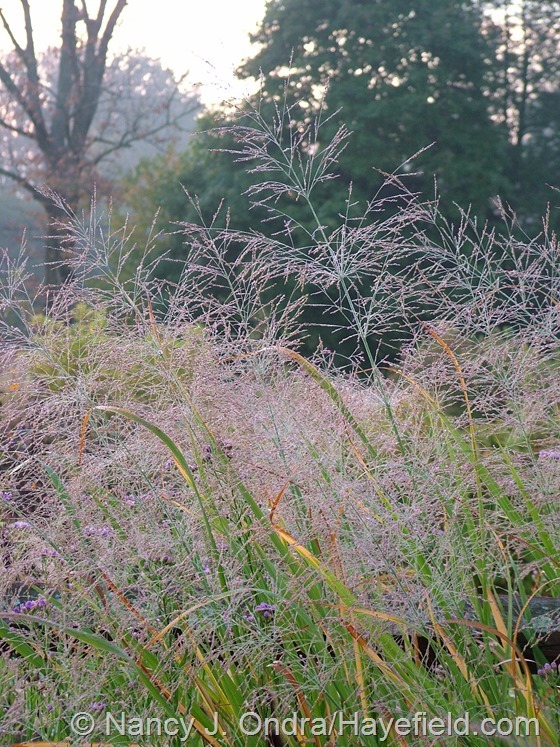 Mid-fall is a terrific time for grasses too, of course. 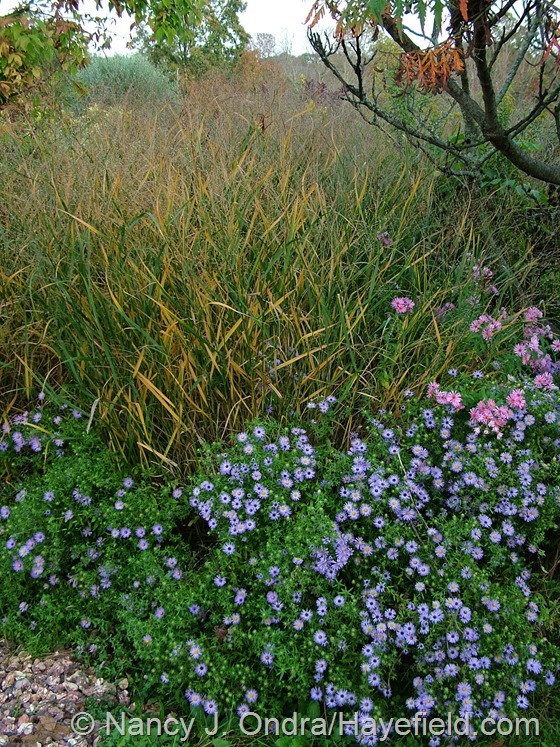 ‘Cassian’ fountain grass (Pennisetum alopecuroides) is with purple Japanese burnet (Sanguisorba tenuifolia ‘Purpurea’) above and southern bush honeysuckle (Diervilla sessilifolia), the seedheads of Joe-Pye weeds (shorter Eutrochium dubium ‘Little Joe’ and tall Eutrochium purpureum), ‘Morning Light’ maiden grass (Miscanthus), and ‘Dewey Blue’ bitter panic grass (Panicum amarum) below. I’m not positive about the ID of the fountain grass above—I salvaged it from a garden that Mom was dismantling at her place—but it looks to me like ‘Moudry’. 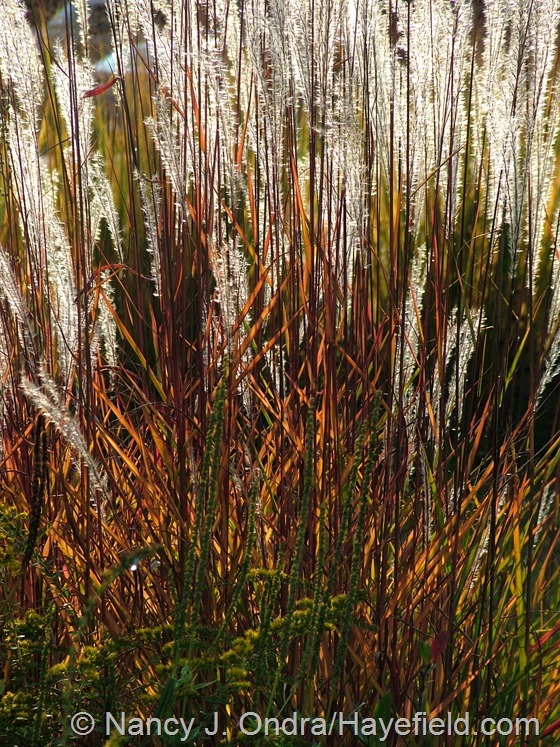 In the background above and close-up below is flame grass (Miscanthus ‘Purpurascens’). 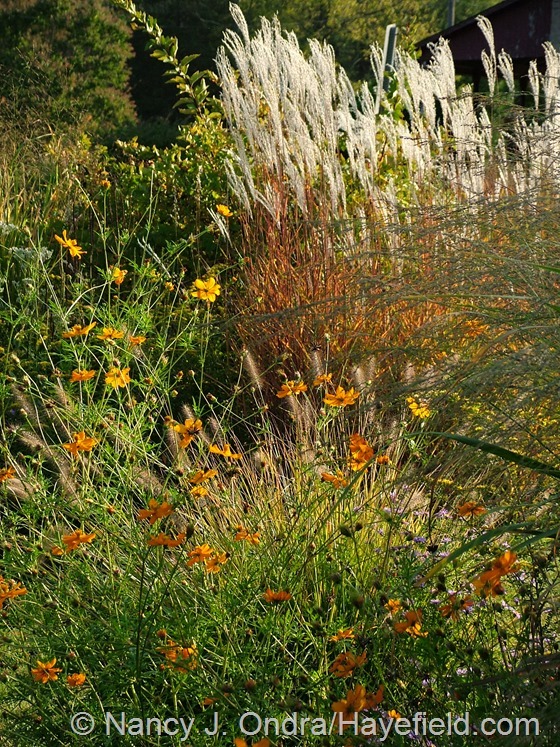 Above, prairie dropseed (Sporobolus heterolepis) in front, Korean feather grass (Calamagrostis brachytricha) in the middle, and ‘Karl Foerster’ feather reed grass (C. x acutiflora) in the back. …P. 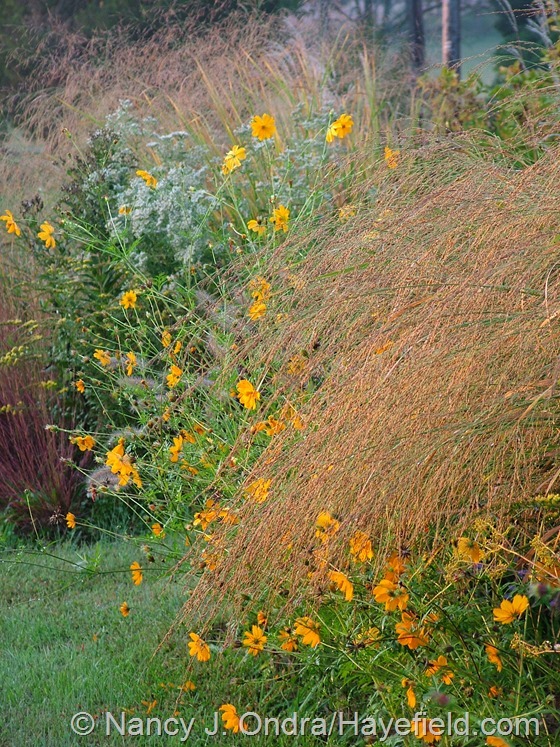 virgatum ‘Dallas Blues’ (above), and ‘Dewey Blue’ bitter panic grass (P. amarum) with sulphur cosmos (Cosmos sulphureus) below. 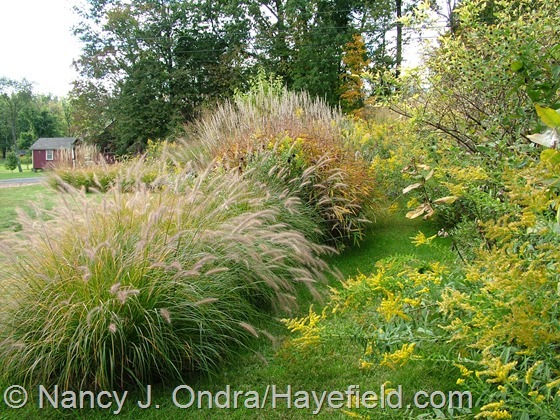 Above, northern sea oats (Chasmanthium latifolium) with ‘Shenandoah’ switch grass (Panicum virgatum); below, frost grass (Spodiopogon sibiricus) against Abyssinian banana (Ensete ventricosum ‘Maurelii’) and exotic love (Mina lobata). That’s it! 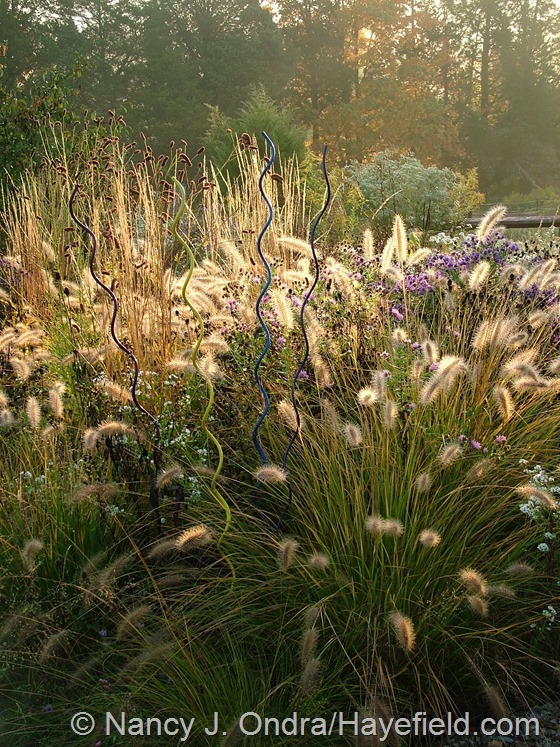 Now, are you ready to see what’s worth talking about in other October gardens around the world? Daniel suggests visiting Carol’s Garden Bloggers’ Bloom Day post at May Dreams Gardens for the complete list of participants. Thanks for visiting us today! Nan–oh wow! What a lift to open your post and see the pictures. 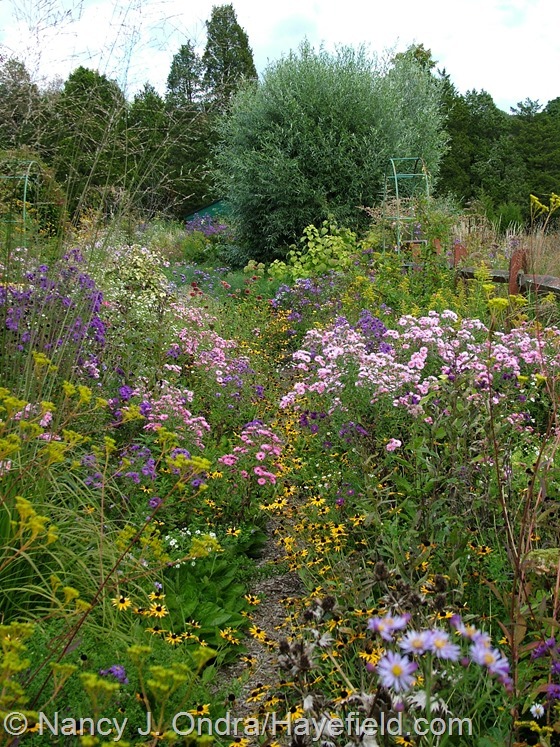 The garden may be slipping into rest, but the exuberance of its “last hurrah”! Thanks so much for the morning lift. I shall walk the day with a spring in my step! (And so glad to see Hella in happy bloom. Ours is settling in nicely. Thanks! Thanks for the update on your ‘Hella Lacy’, Nora. I’m so glad that she is doing well. 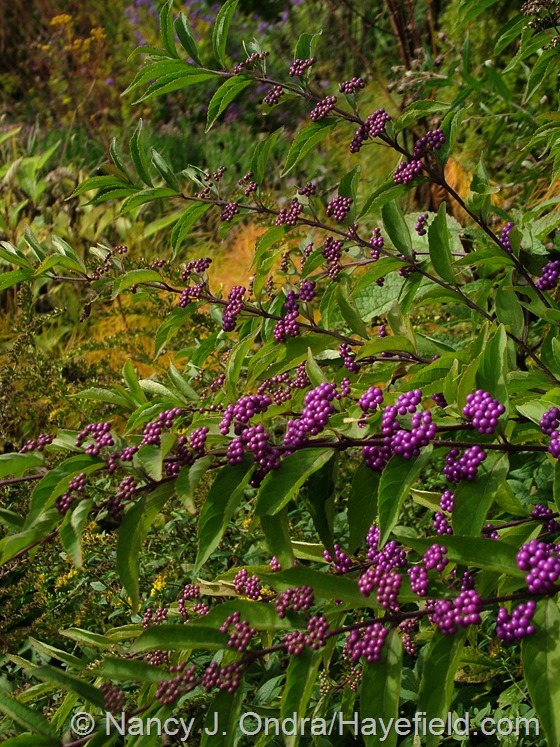 May she treat you to an abundance of those rich purple flowers next fall! My Sheffield Pink Mum is blooming nicely and makes me think of you. Hasn’t the fall weather been glorious? Thanks for this magnificent post. Happy fall! Isn’t that leaf too cool? I think that delighted me more than any of the other leafy spectacles this fall. And that’s great news about the ‘Sheffield Pink”; may it live long and proliferate! 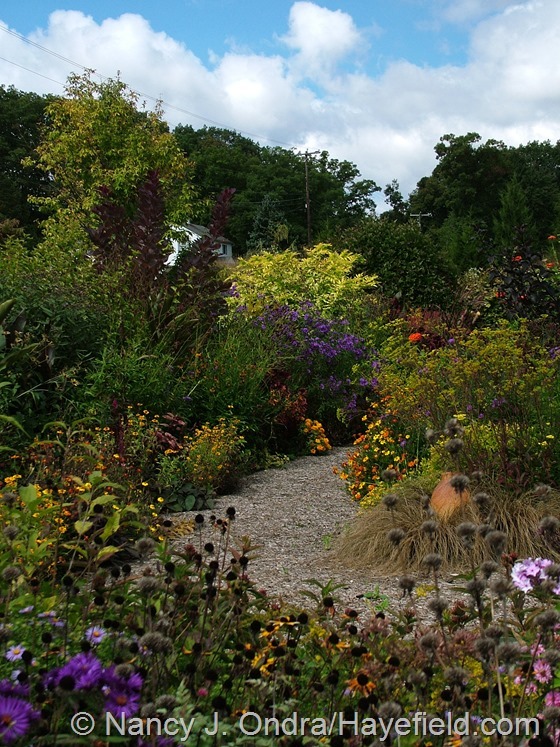 You had created a dream fall garden! I never fail to impress me with your great photography! Lots to learn from you! Thanks for sharing! Thank *you* for visiting today, Daniela. It’s hard not to get carried away with the photography this time of year, so it’s good to know that you enjoyed it. Happy Bloom Day! I am back! Sorry for the typo! 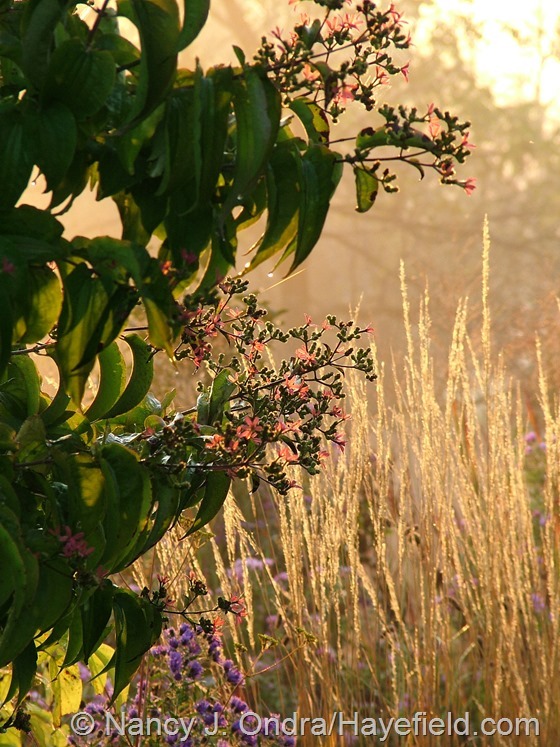 YOU never fail to impress me with your gardening talent and photography! My garden hat is off to you! Yikes – I didn’t even catch that, Daniela. I do hope that your own gardening efforts make you happy! The back lit shots of the plants with the morning sun are absolutely stunning! Great photography work. So inspiring to get our gardens a fraction of what you have growing at Hayefield. Thanks for the beautiful images. Hi Paula! 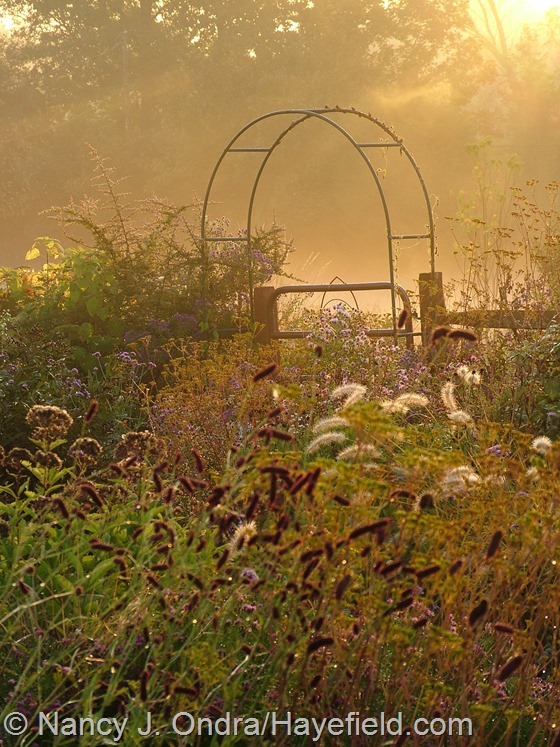 The light is one of the best things about this time of year–especially the way the sunrise hits the side and back garden and meadow this time of year. And I don’t even need to be outside all that early to capture it. What a wonderful ending to the season, Nan. Your photos are spectacular and you are so generous with them. Looking forward to the next time you post in the spring. Thanks for taking the tour today, Lorraine. I can’t believe that our part of PA still has had frost yet; we’ve been so lucky! 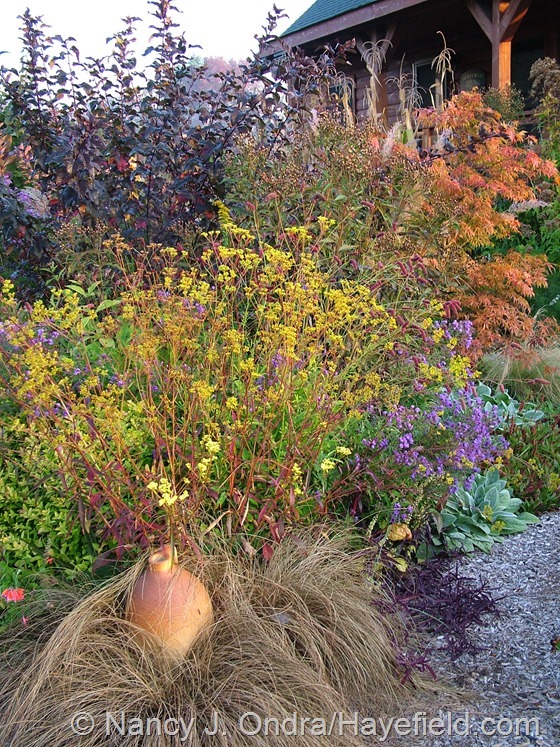 Your garden is looking very pretty this fall….so many neat plants. I want them all. I really love the picture of the path to your front door. I have seed of the popcorn plant(Cassia) if you’re interested. I really appreciate the seed offer, Melanie. It looks like we’ll still be frost-free for the near future, so I still have hope for mine maturing, but if not, I’ll ask! Nan: Gorgeous as always! I love seeing all the new things you are growing, plus plants we both have in our gardens. Inevitably, yours are always used better than mine are! Great to hear from you, Barbara! Well, remember that my garden here will always be several years older than the one you have now, so I have an unfair advantage. Nan, What an amazing feast for the eyes! I must say…. 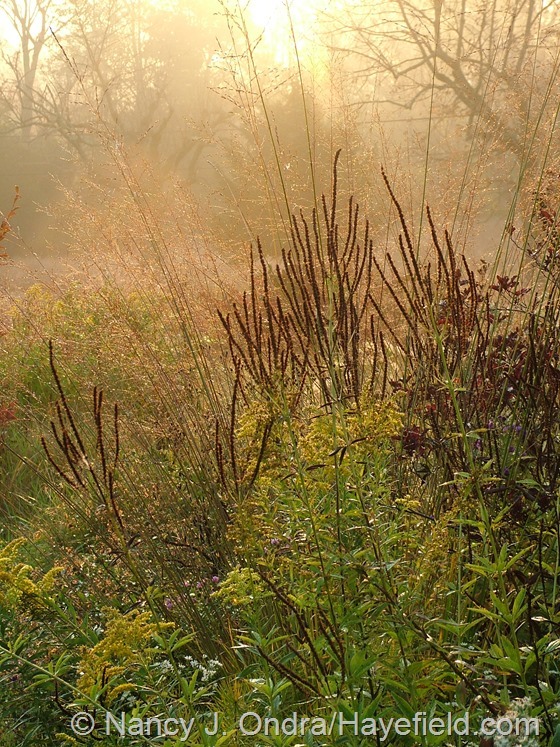 that last photo is my favorite, with the play of sun casting sepia tones…. just incredible! The cathedral bell is stunning. I’ve never seen them before… never tried to grow them. 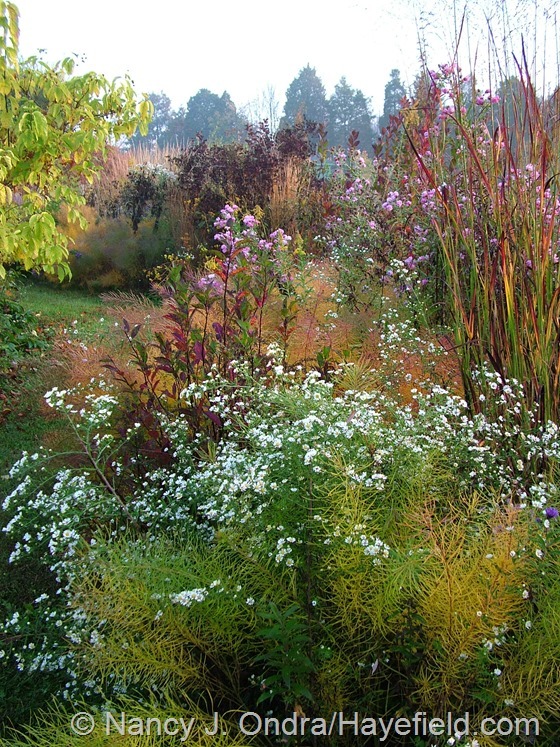 I have to say, I enjoyed a fabulous break from weeding and doing a bit of fall planting to “stroll” through your garden. Now you’ve motivated me to go back out and weed some more LOL. I’m normally not a big fan of humidity, but it does amazing things when combined with that low morning light, doesn’t it? Good luck getting caught up on your weeding, and may you enjoy every minute of this beautiful fall weather, Cathy! Fall is such a magical season, and your pictures never fail to capture that. I look forward to your next post on the foliage shots. 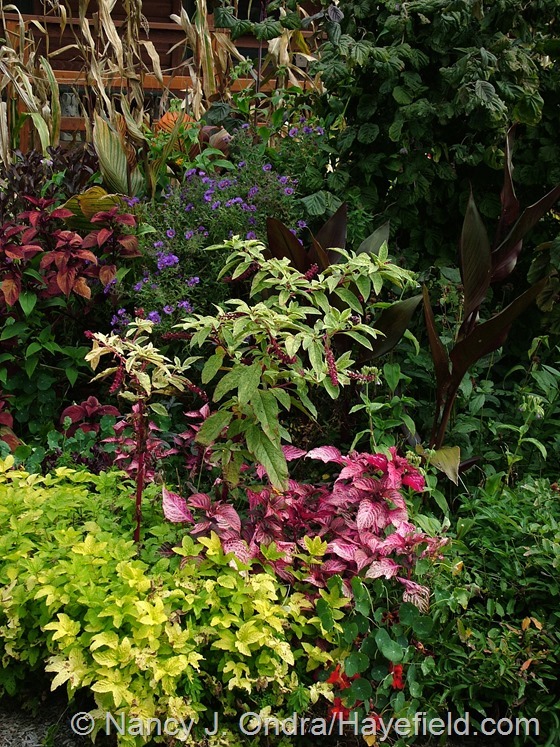 I adore the Shrubbery – I can imagine taking a stroll early in the morning, a cup of tea in one hand, and just exploring the different hues, textures and forms all around me. You never cease to inspire, Nan! 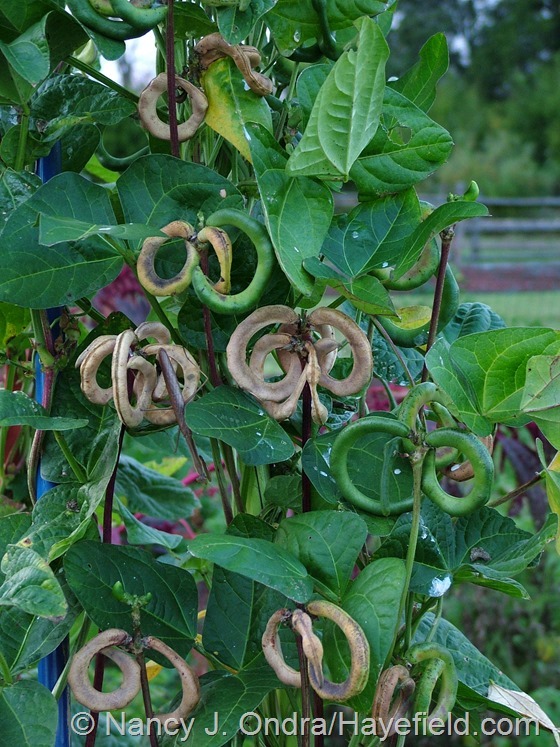 10 years to wait for the Cobaea scandens to flower is an awful long time. I admire your persistence! You must have finally found a spot for it that it likes. I hope to see it in bloom again next year. It was certainly well worth the effort and experimentation, no? Hah – instead of a cup of tea, LJ, imagine me wandering around with my camera. One of these days I’m going to have to try the tea so I can actually *look* at the plants. 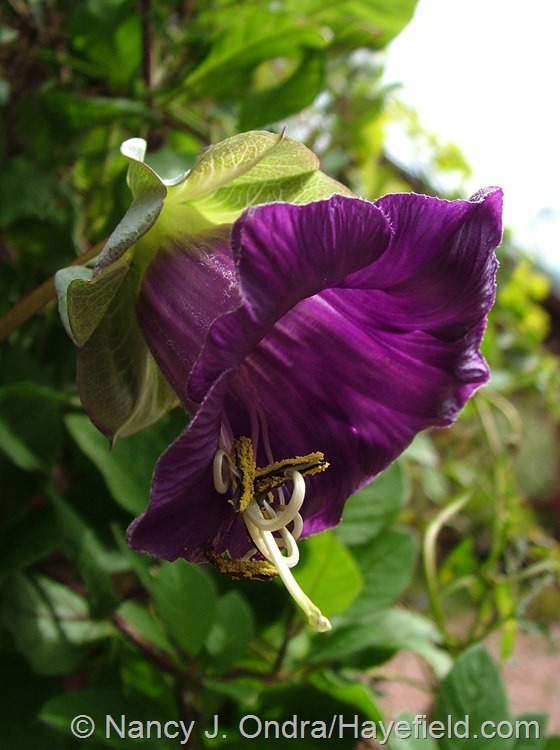 And the Cobaea…well, now that I’ve finally gotten it to flower, I may just move on and give something else a try. There are plenty of other things I haven’t yet had luck with! I feel like I just received two extra chapters of Fallscaping in my inbox. Thank you very much. Have you eve considered a follow-up? What a lovely thing to say, Patrick – thank you! I’d love to do a follow-up to Fallscaping, but that would be up to the publisher…or maybe I could add it to my list of self-publishing projects for when I have some free time. Hi Nan, thanks for the ID on the Senna/Cassia. Lovely pics as always. 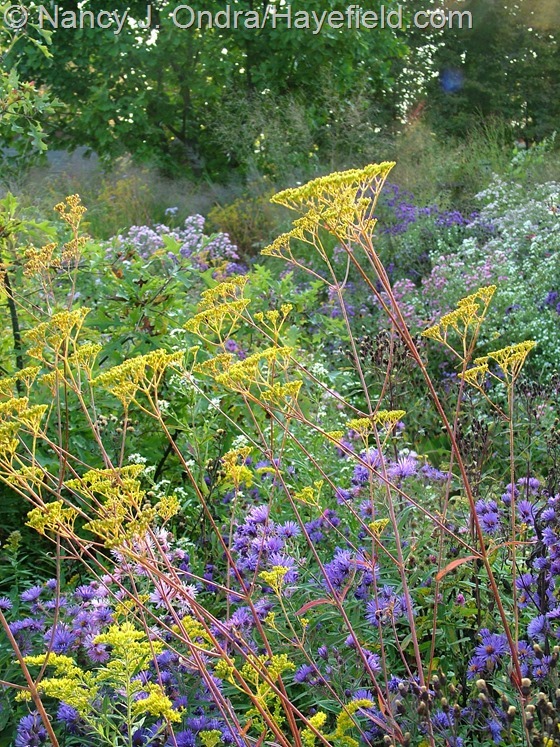 That Bidens is gourgeous, such bright colors. 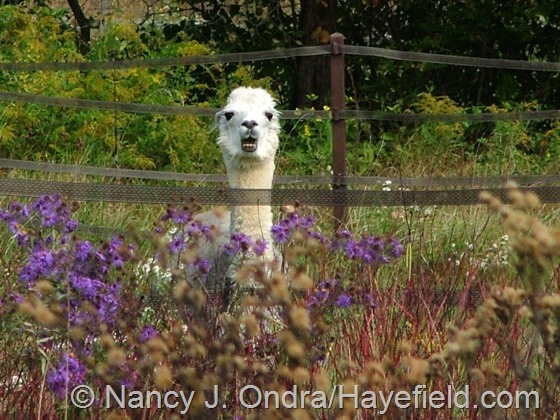 The pic with Daniel cracked me up, Photographing pets is just about as fun as plants. My wife & I have 2 Chihuahuas, 1 Boston Terrier & 1 Cat…all spoiled rotten of course & plenty of photo ops too. That’s a lot of material for picture-taking, Rick! I’d like to give Duncan equal attention, but he’s not much for making eye contact at the best of times, and when I have a camera, he pretty much keeps his head turned away. Daniel, on the other hand, likes to keep his eye on me at all times in case food is forthcoming. 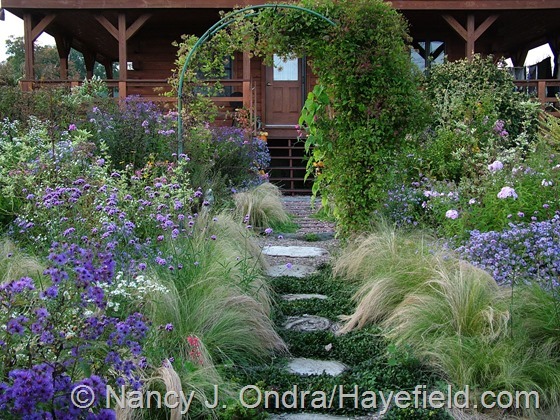 No matter the season or the subject of the post, your garden is always amazing: the scale, the variety, the combinations of form/color/texture are a thrill to see. 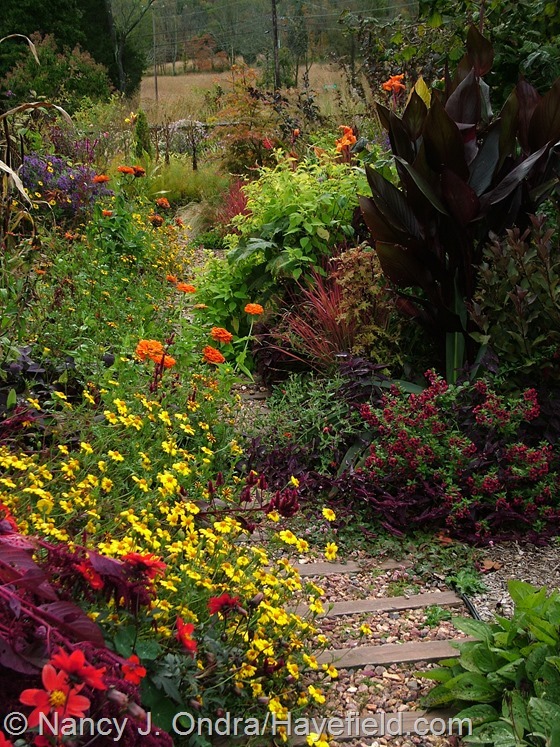 A tremendous amount of work must go into your garden but I am sure the satisfaction is equally big! By midsummer, the work does seem overwhelming, but by this time, it’s all worth it. Thanks so much for visiting, Linda! Oh, super – I’m forever associated in your mind with dead roses. (I’m just kidding – I do know what you mean!) You have the right attitude about using the loss as an opportunity for something new. 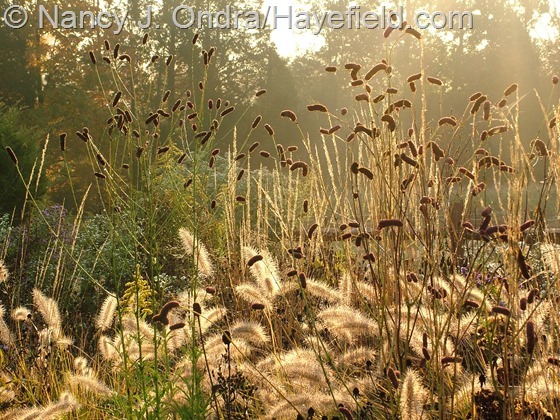 The beauty of the season, but right now, the seeds are more distracting; I just came in from a walk through the meadow to gather seeds of the native grasses. Chuckle, no, not really. 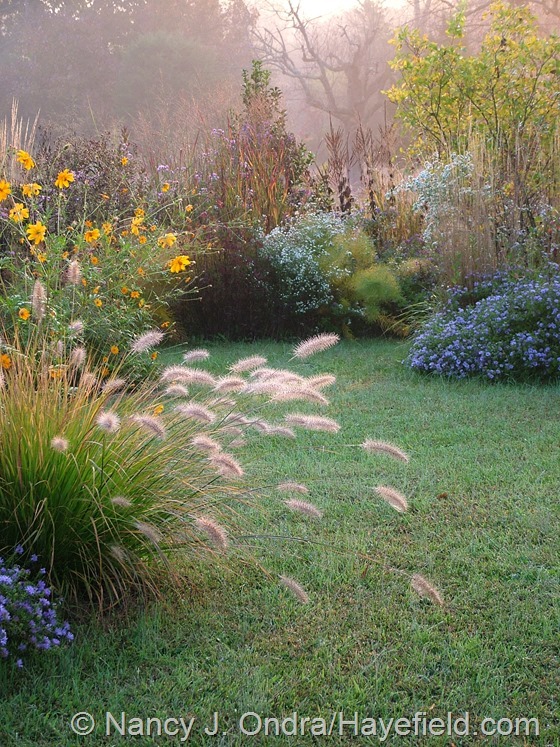 When I think of you, I think of grasses and Fallscaping dear girl. I do tell people no one was writing about Rose Rosette until I read your post and discovered what was wrong with my plants. Your ears will be burning November 10 when I speak to the Tulsa Rose Society too. I figure you deserve the credit for being one of the first to talk about it. I wish I could have sent you the beautiful fall day we enjoyed here today, Dee, but greenhouse air is wonderful too. Have fun with your seed hunting. It’s a very addictive pastime! The insect damage on the Australia Canna is done when the leaf is new and still rolled. Then when the leaf grows it looks like it is perfectly spaced. Yep, I noticed the one tiny notch and have been watching the leaf unfurl. But I didn’t really appreciate the pattern until I saw the sun coming through it! Superb photography as always. 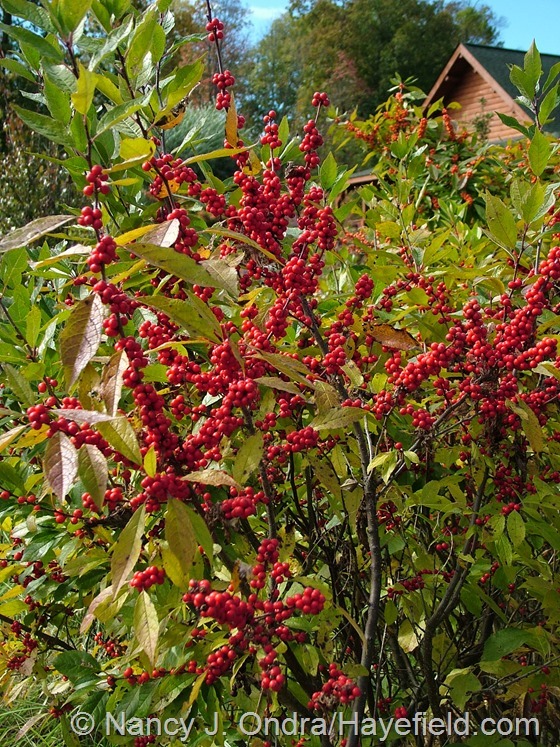 Can you suggest a source for Persciaria ‘Crimson Beauty’? Hi Alice! Plant Delights currently has it in their online catalog as Polygonatum cuspidatum ‘Crimson Beauty’. You are an artist & flowers are your medium…happy gbbd! Thank you so much, Janie! I wish you a lovely Bloom Day in return. 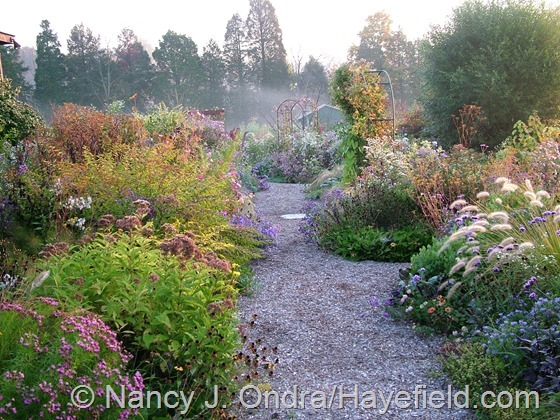 Nancy, I felt I, too, was privileged with an early morning stroll through through your amazing garden. I am quite jealous! Not only do you have a tad nicer weather in your locale than here in central WI, you have a larger space than I! 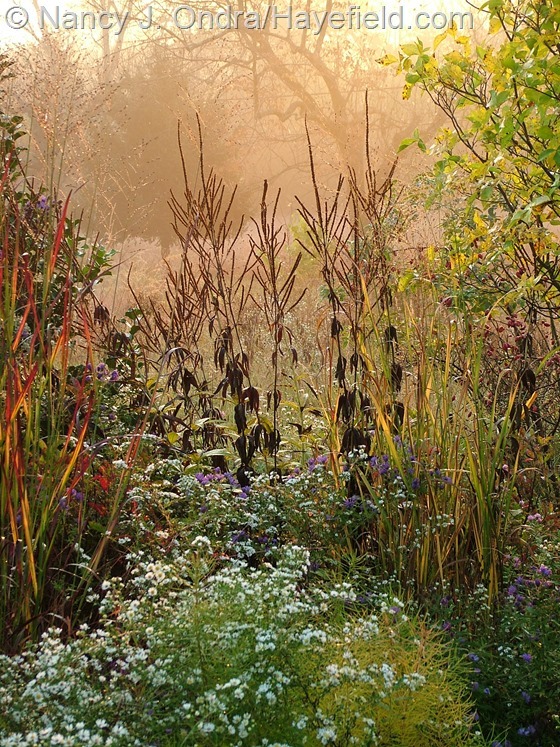 I am quite taken by the look of your garden in fall. 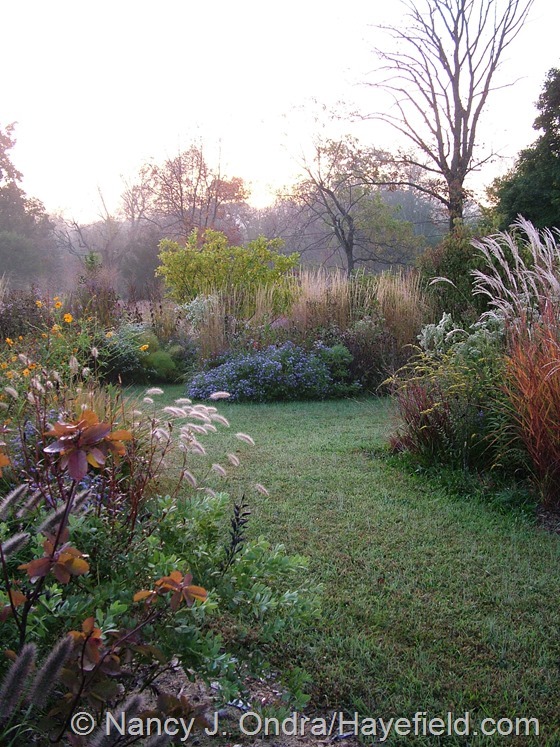 Interest through fall and early winter is something I feel so many gardeners tend to ignore. 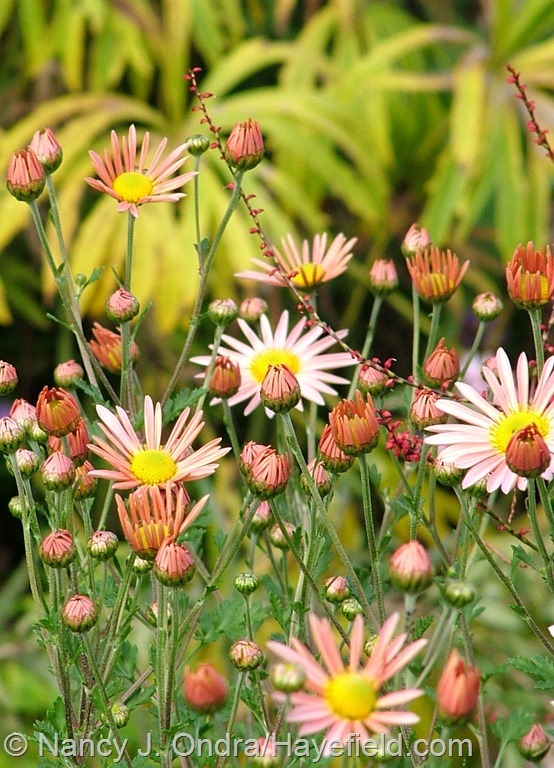 The Sheffield Pink is a plant so ignored by “spring” gardeners, but can be such an incredible addition to the fall garden. I see you make a lot of use of Japanese burnet. It is so much like the rambunctious ill-mannered knotweed here, I would be terrified to try it. It is one of the worse annual weeds in this area. 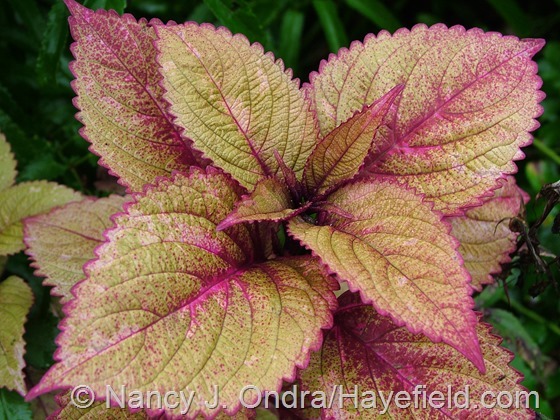 I am continually lusting over the oak leaf hydrangea and seven sons but have not gotten the nerve to try them as I am just pass the prevailing wisdom in this area where they can be grown perennially. The Olbrich seems to manage them, but I am possibly a half zone, maybe less colder. Oh, Rachelle – since you obviously appreciate beautiful late bloomers, can I possibly convince you to give the Japanese burnet a try, at least? I agree that there’s a slight resemblance in the nodding form of the seedheads but the burnet is such a beautiful deep reddish purple color, and it’s not at all weedy. I’d be happy to send you some seed. Lovelly photos – all of them – but maybe the photos of the grass Chasmanthium latifolium is one of the best one. Can´t you give us some old photos to enjoy under the winter!? Funny, last autumn I was thinking of getting som more Colchiums (I have 3 different) but I completely forgot. I have to make a note of it. It is so nice with something which are flowering this time of the year. But maybee I will get some ot the autumn flowering Crodus istead! Or also both…..
Oh, I have plenty of photos you haven’t seen yet, Susie, and I already have several of my winter posts planned out. 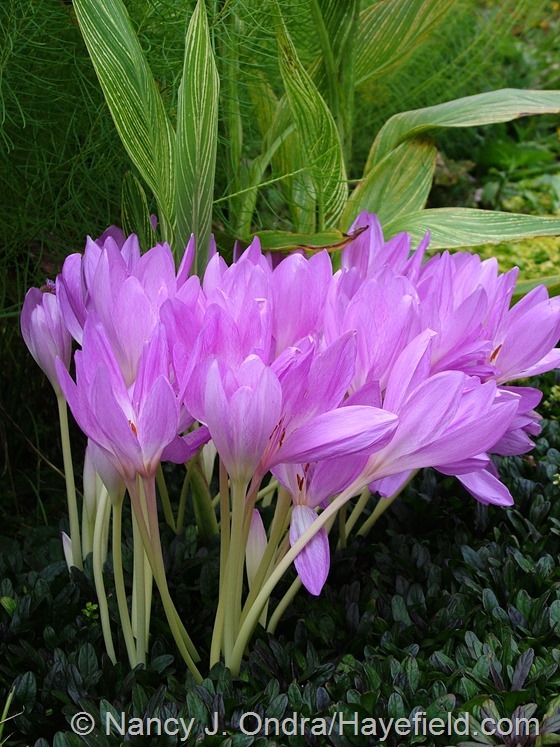 I hope you do treat yourself to some colchicums and/or fall crocus; you can’t have too many! 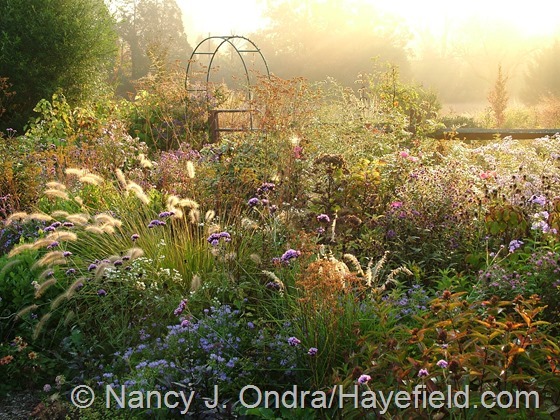 Another incredible photo gallery of your garden. Thanks so much for sharing you photos and expertise. Good to hear from you, Freda. 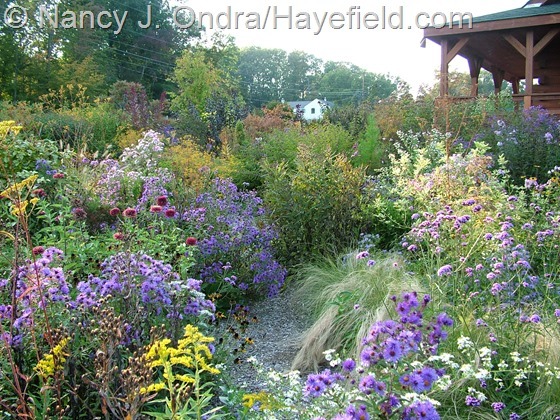 I hope you enjoy a glorious fall season in your own garden! 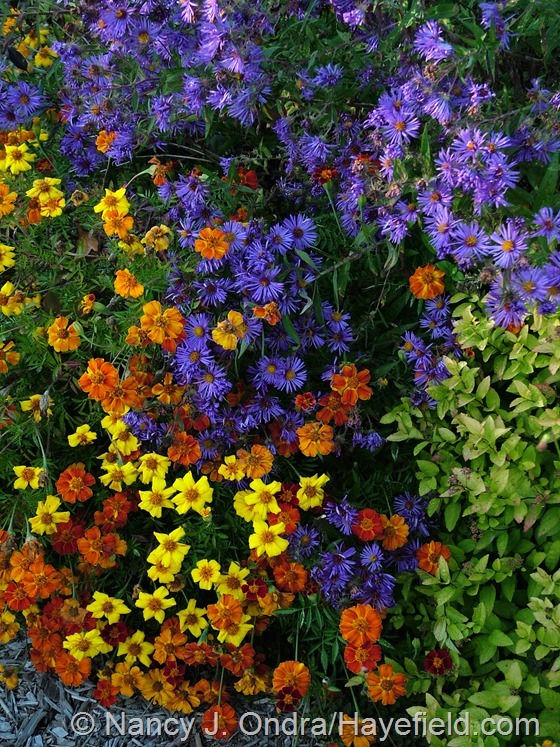 It’s sad to think this is your last Bloom Day post for the year – I always review your entries with my western garden guide at my elbow to see what, just maybe, I could try growing in my own garden on the left coast. Based on this post, I think I should try the annual Ipomoea nil and some Persicaria (other than the ‘Red Dragon’ I already grow). And I was amazed to see the Dunce Cap – I’ve never seen it shown in bloom and I was impressed. Thanks, as always, for the spectacular pictures. 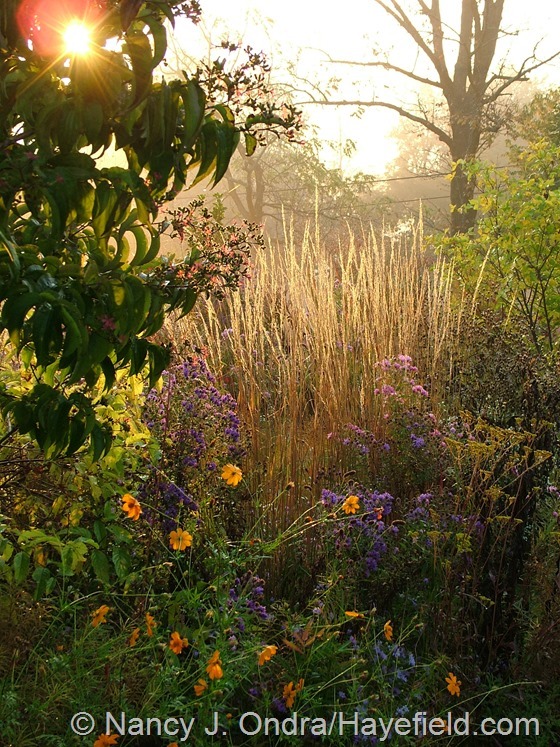 Those with the sun filtering through the foliage are particularly beautiful. I’m so happy that you saw some things of interest, Kris. I haven’t thought to check that morning glory for seedpods yet, but I definitely will tomorrow, and I’ll grab some seed if I can. 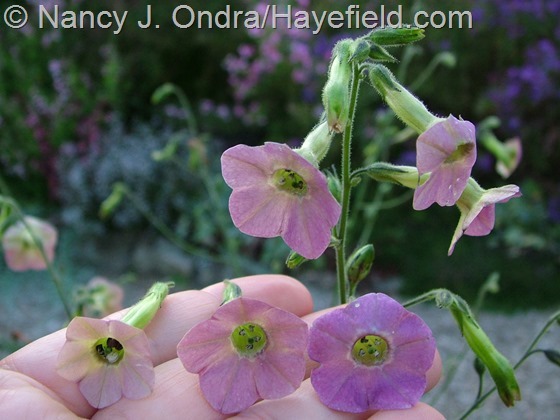 And yes, aren’t the dunce’s cap’s fuzzy flower towers surprising when you’re used to seeing the little gray rosettes? Thank you for an outstanding and inspiring post. Your imagination and capabilities are boundless. Your last group of “comment free” photos really should be available as a set of notecards. Social media is quite pedestrian and some of us would enjoy a departure from the ordinary. Hi there, John, and thanks! 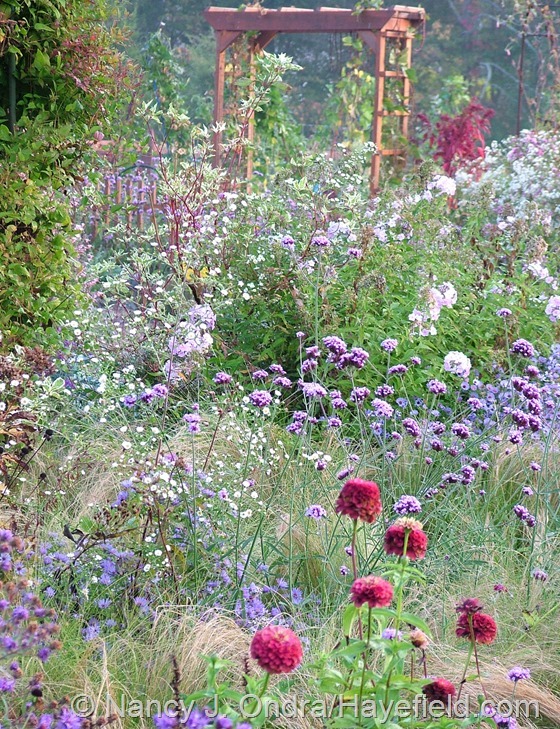 Did you see that Carolyn Walker has already gone the notecard route with her own garden pictures? 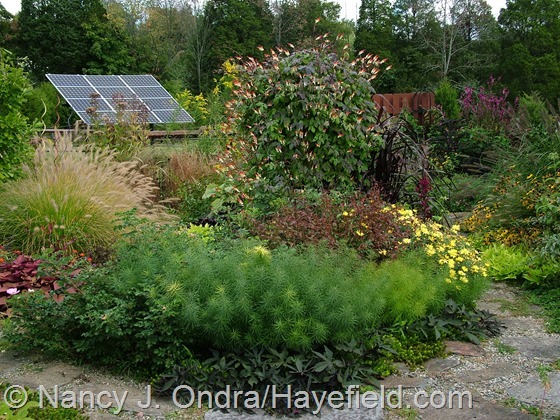 In case you missed her announcement, you can see it on her blog: Carolyn’s Shade Gardens. My best to you and your family! Do me a favor Nan, publish a book right now with every photo in this post and I will buy it at once and look at it every day.Money is no object. Oh, that’s soooo tempting! I’m writing another book now, but as soon as I get through that and the seed project, I will definitely think about something along those lines. In the meantime, I thank you for the idea! OMG Nan! You are such a master. 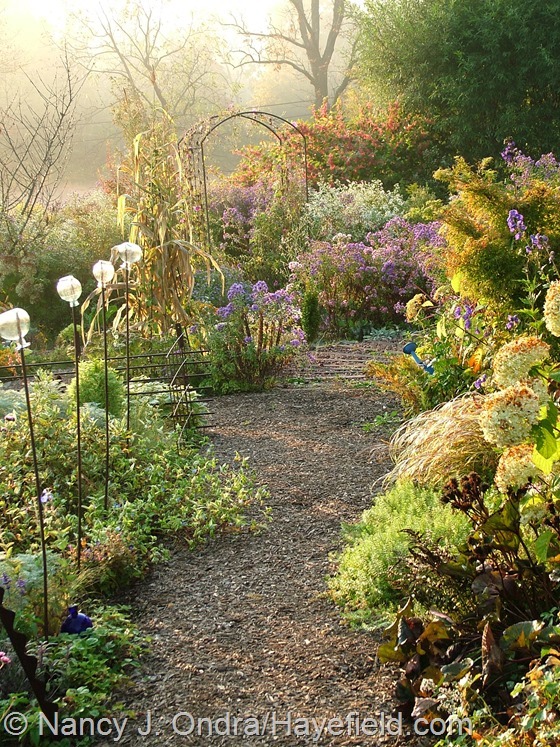 Your autumn garden is incredible. 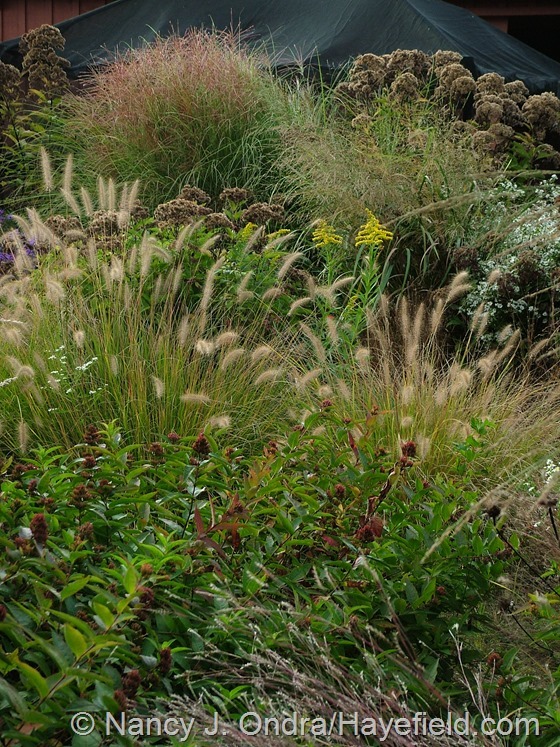 Love the grasses and the rich colours. I will find an hour or so, make a coffee, and peruse this post at length. Thank you for always being inspiring. Enjoy your coffee break, Kerry, then get back outside and enjoy your spring garden for me! 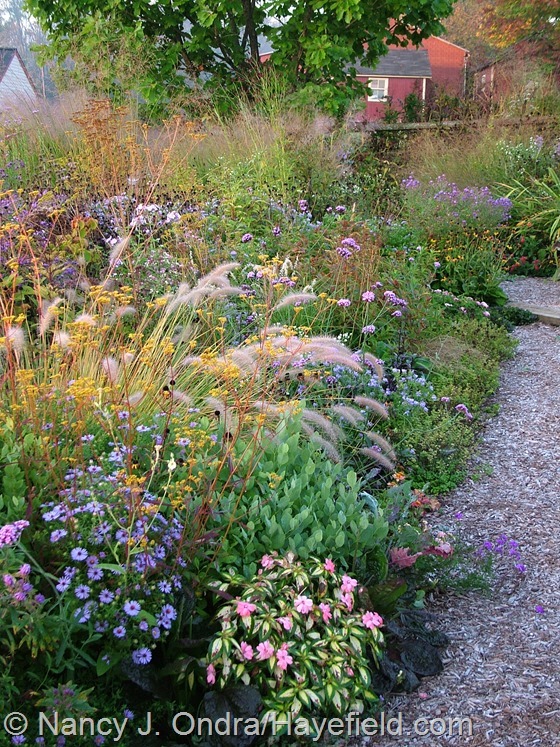 I love seeing what you have done with all the grasses, I’m going to try more in my garden next year. The shots with the autumnal golden haze are so wonderful, that is perhaps the best thing that happens in the fall to make everything glow. 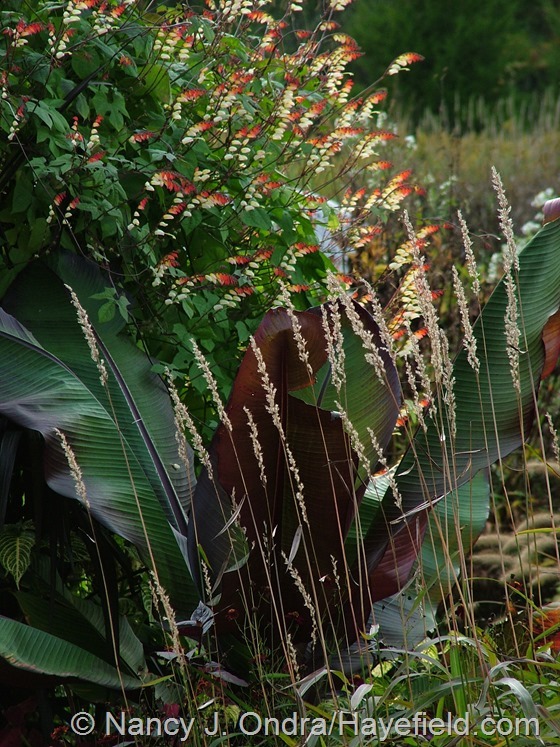 The Mina lobata and Persicaria ‘Crimson Beauty’ are fascinating, I’ll have to at least try the Mina lobata since hummingbirds like it. 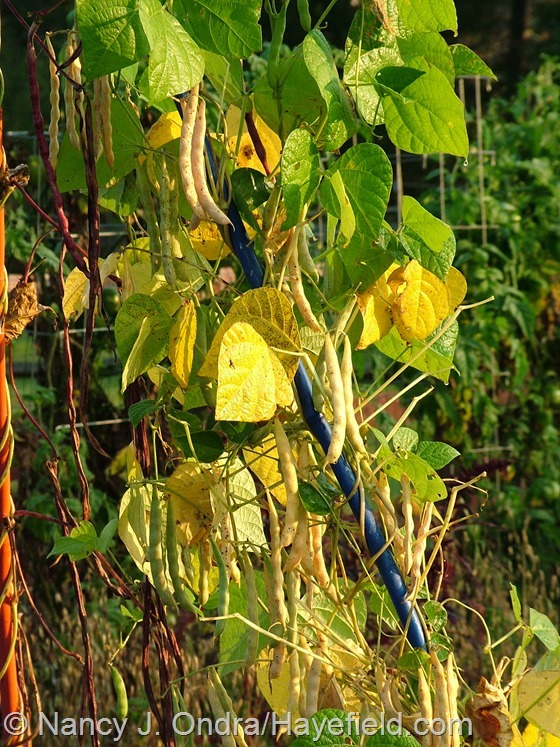 I plant runner beans every year for them. You’re so right about the special beauty of fall light, Hannah. 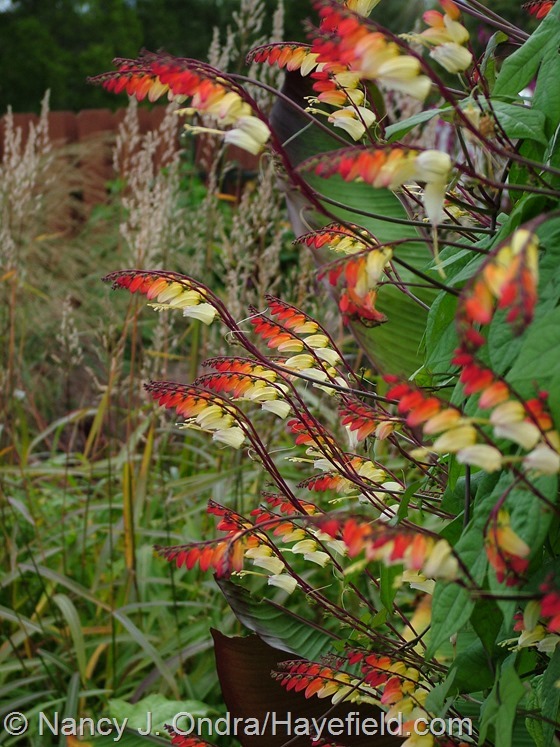 If frost holds off for a couple more weeks (a 50-50 proposition, I think), I should have lots of Mina lobata seed to share. As usual, a hushed ‘wow’. I hope frost holds off long enough so you can really soak in all this beauty. 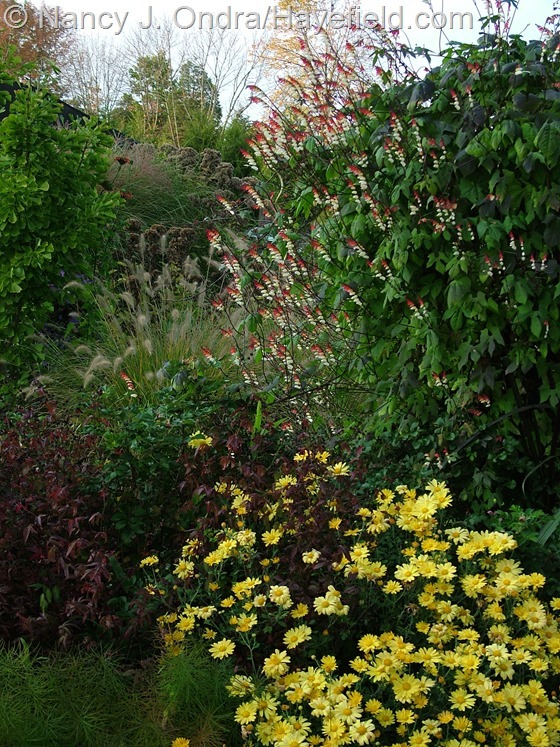 Love all the flowers coming up out of the stipa in the side garden pictures, and thanks fr putting a name to the winter senna. I had one pop up in a bed this summer and liked the foliage but have no idea where it came from… for a little while I was wondering if somehow a peanut got in there! 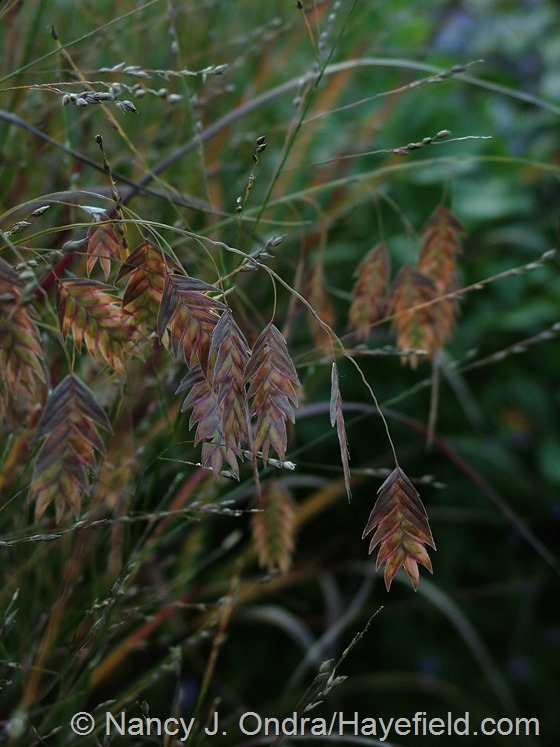 With a certain amount of regret I evicted my last fountain grass this spring… too bad with the self seeding. I may try one last time with some of the dwarf ones which seem sterile, but the ‘moudry’ types were just too much for me. I hear you about the fountain grass, Frank. 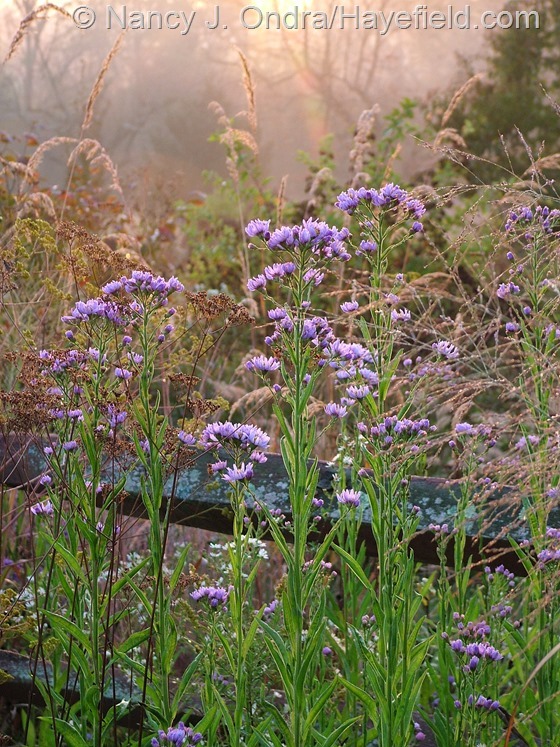 I love it, but ‘Cassian’ has really seeded into the lower meadow. And now that I’ve seen the flowers on the one I got from Mom (it never bloomed at her place, because it was in shade), I’m really concerned, because I know how readily ‘Moudry’ seeds around. I wonder if I’ll have the discipline to snip off the flower spikes soon, before they set seed. If not, I guess I’ll be unplanting them. 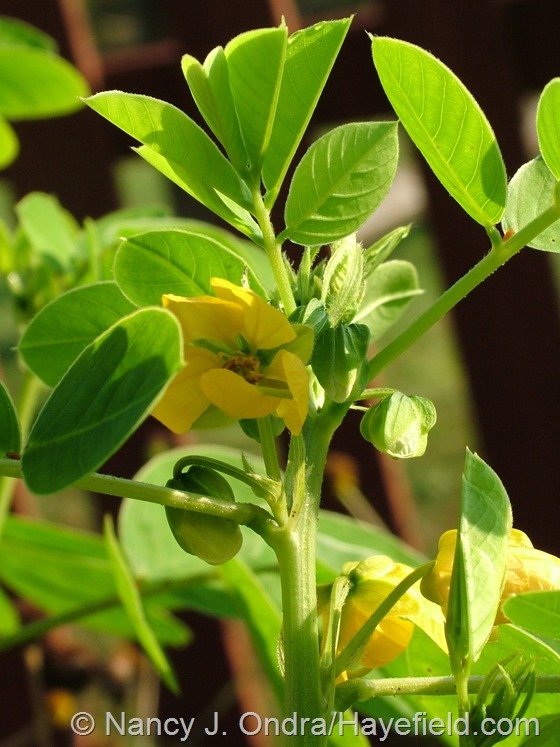 And yes, you’re so right about the senna seedlings looking like baby peanut plants! 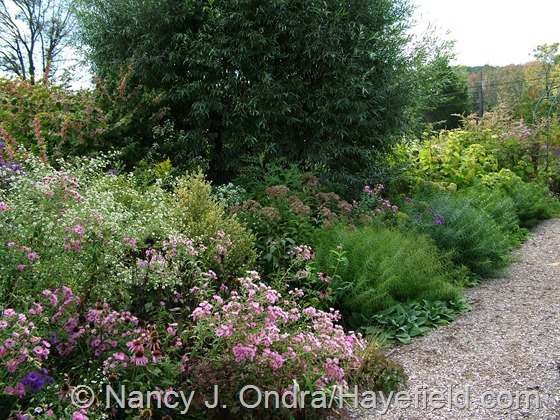 I always enjoy looking at your garden photos…it is always the most wonderful walk through your garden. I really appreciate your layout-design and your plant selection. Hey there, Charlie – thanks for stopping by today. We’re starting to get frosts here, so the gardening season is pretty much over in my part of the world. I hope you get to enjoy your own garden a bit longer, at least. Dear Nan, long before I started to follow your blog, I used to drool over your books and use them as daily references. Exuberant colors, unusual combinations and sunny disposition would define your work for me. 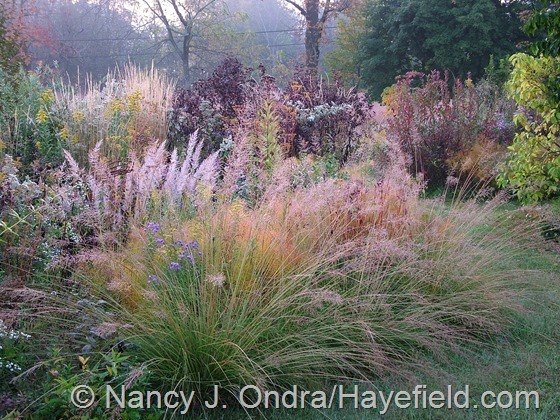 I learned about the importance of foliage and the numerous colors other than green you can use, extended my grass collection and fully enjoy the fall display. When I stumble upon Hayefield last year I knew immediately it is you or someone stole your signature design style! 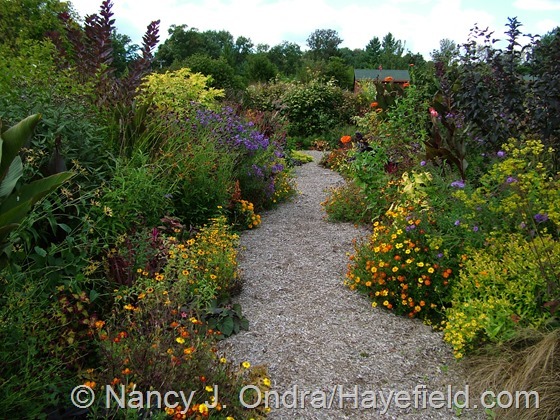 It is such a honor to follow your work, your garden is breathtaking and full of wonders! Thank you so much! When can we expect a new book? Hi there, Mihaela! I’m honored to have you as a reader, both of the blog and the books. My next book (The Five-Plant Garden) will finally come out next March, and Rob Cardillo and I are already well into producing the follow-up volume – thanks for asking!